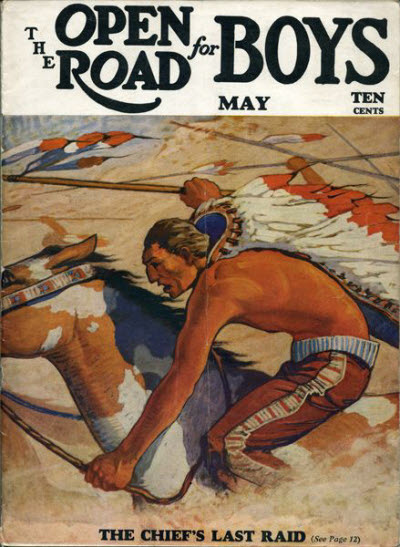 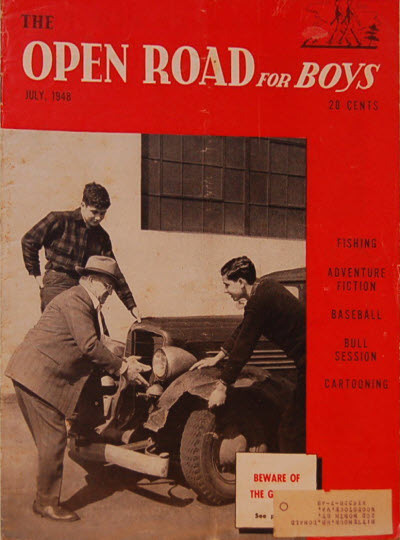 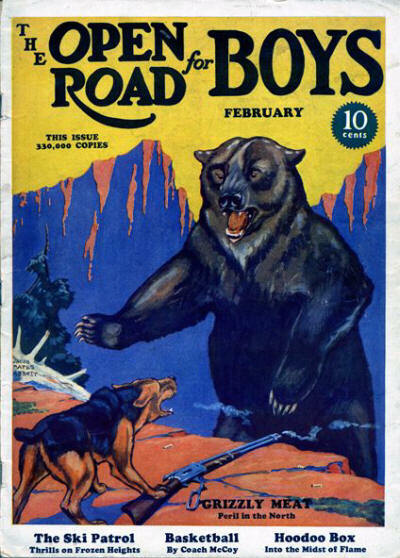 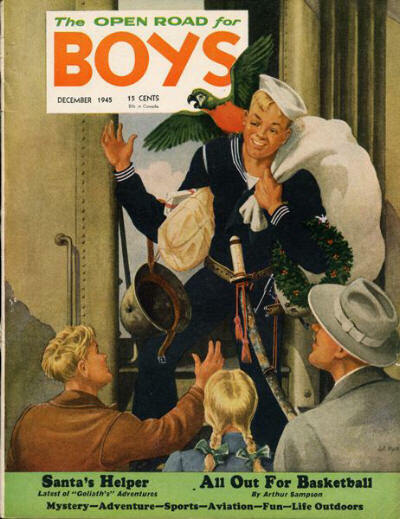 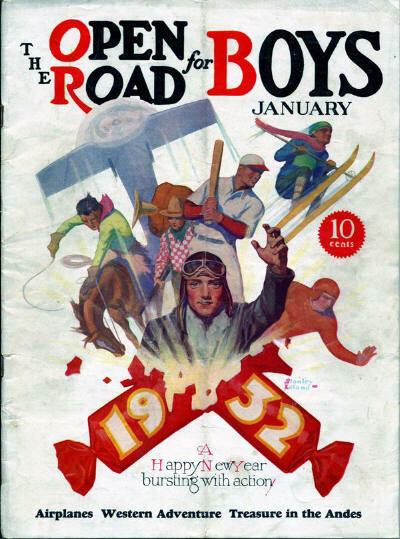 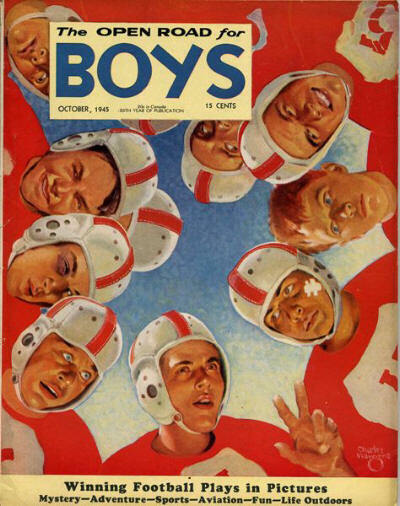 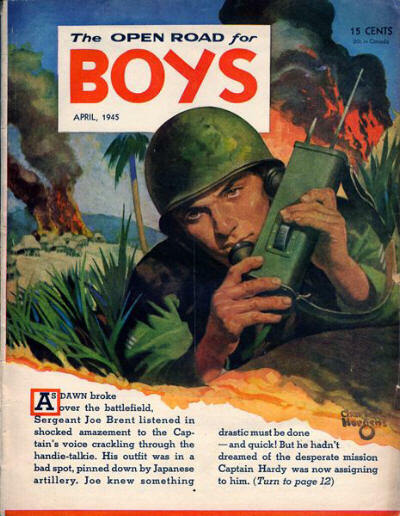 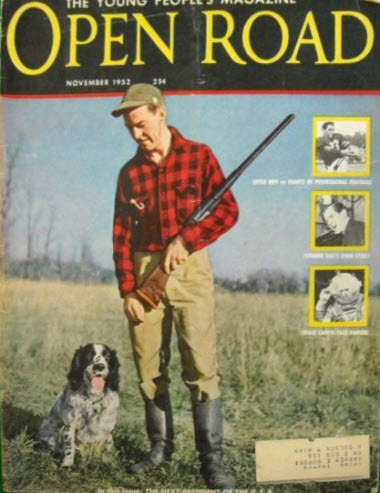 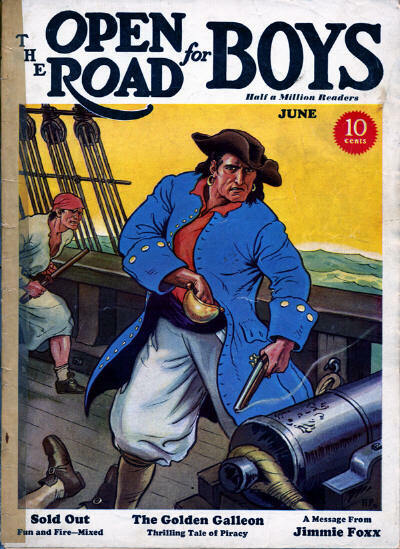 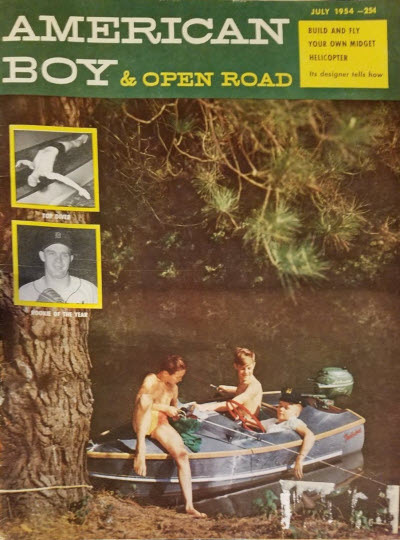 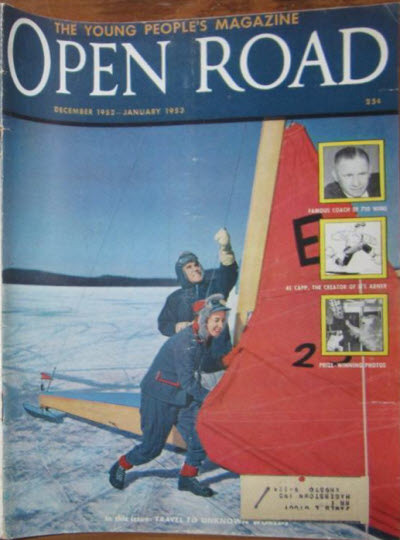 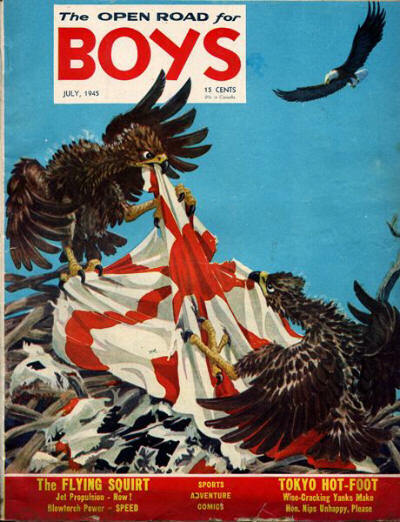 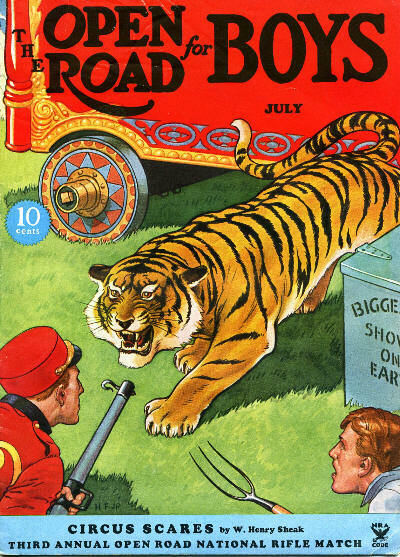 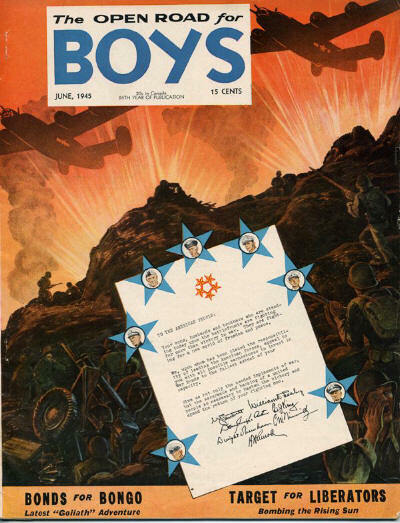 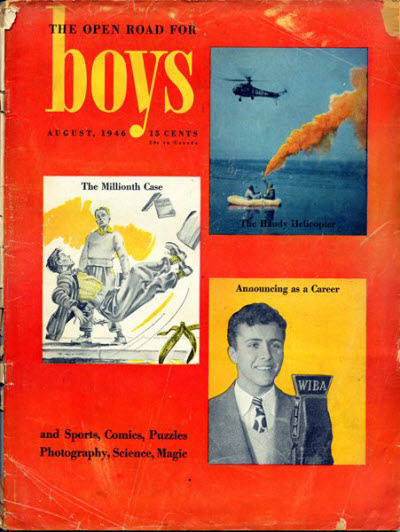 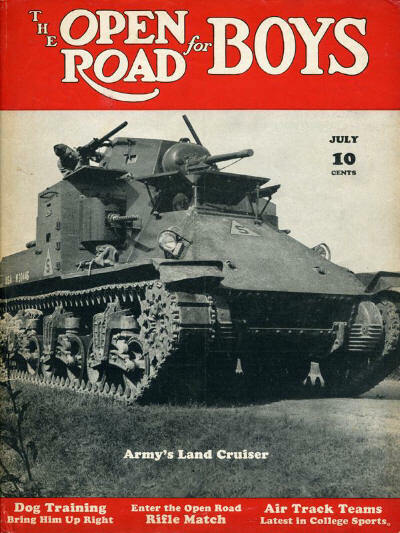 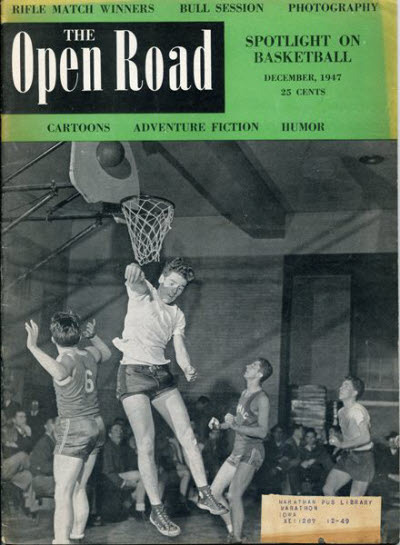 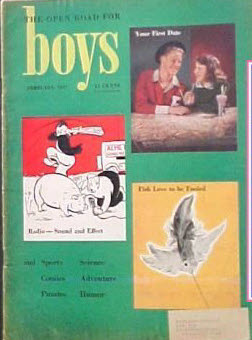 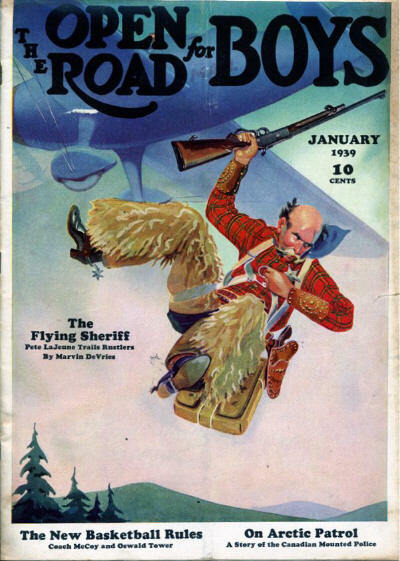 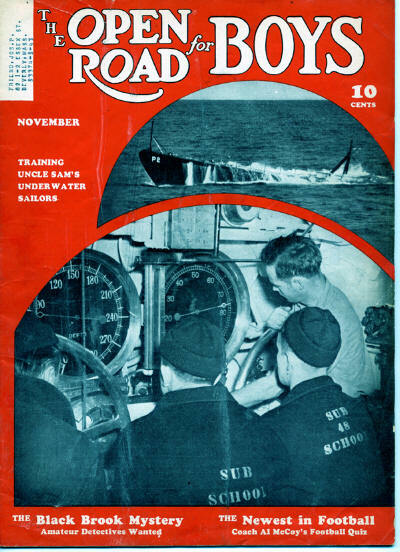 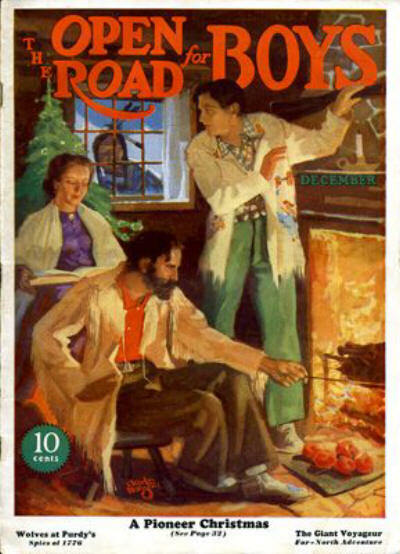 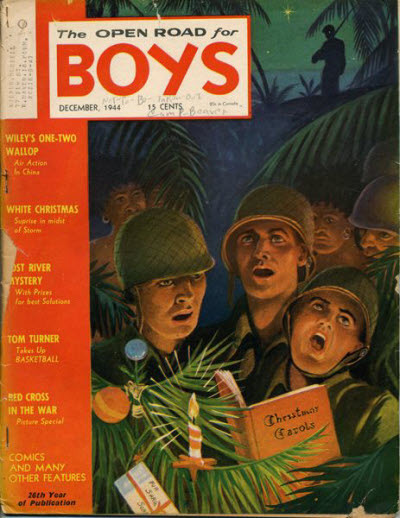 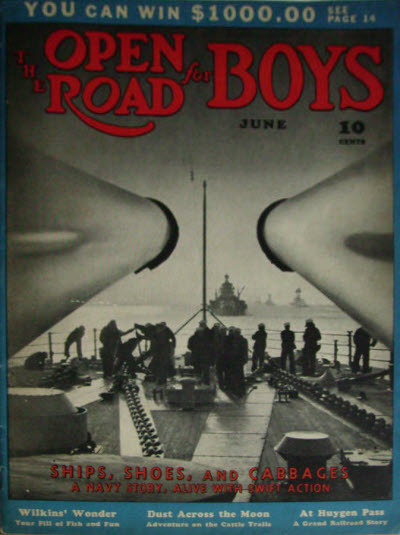 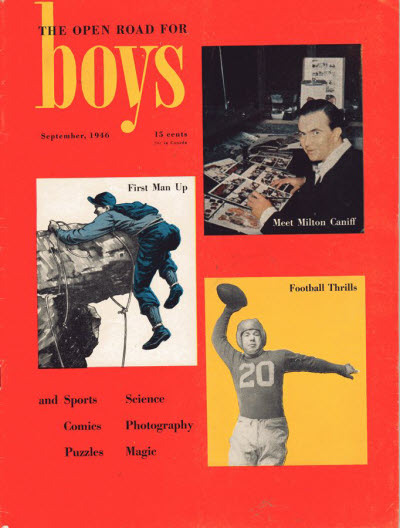 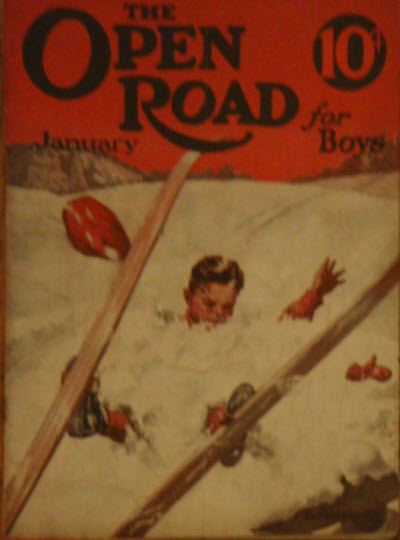 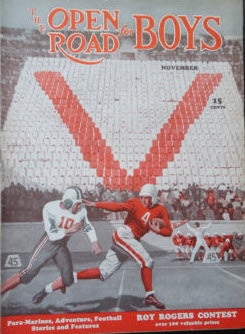 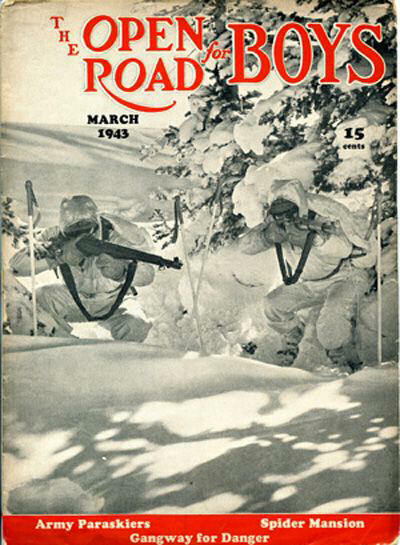 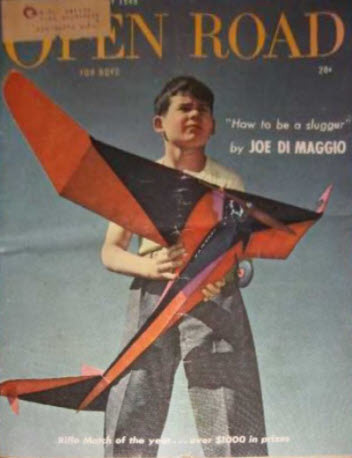 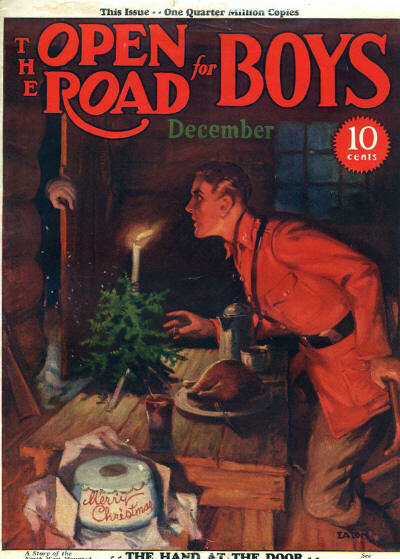 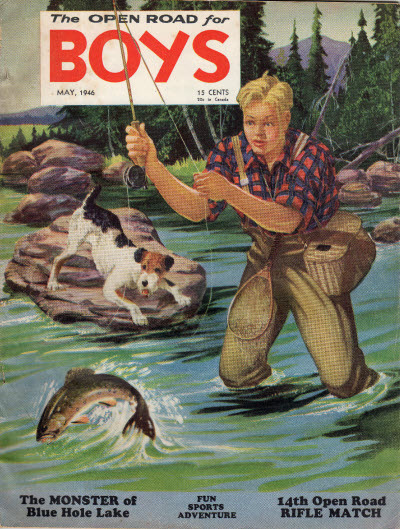 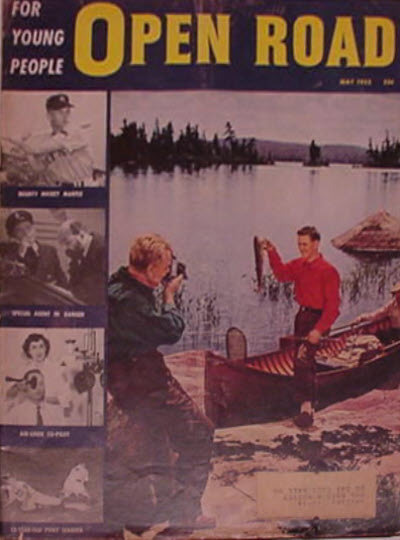 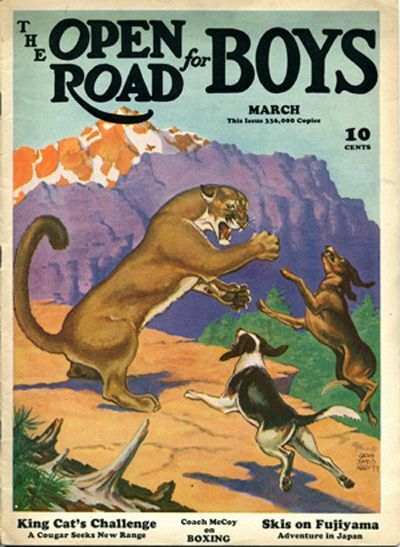 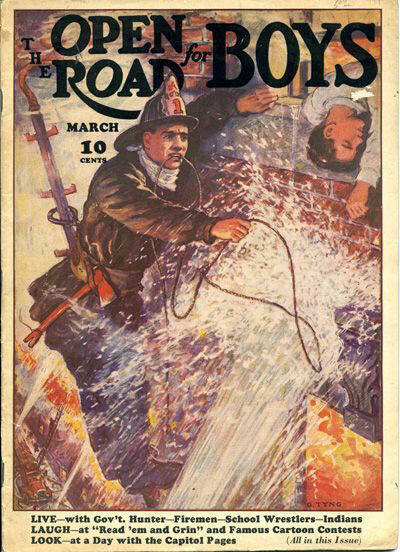 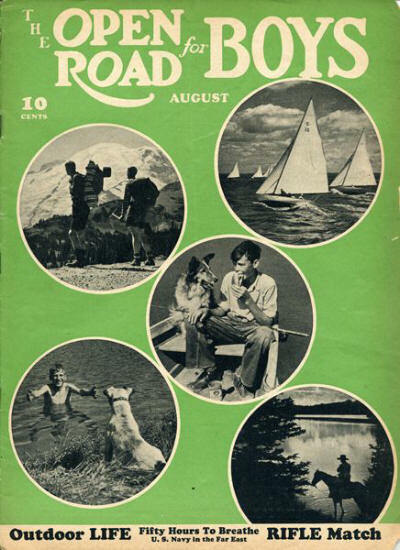 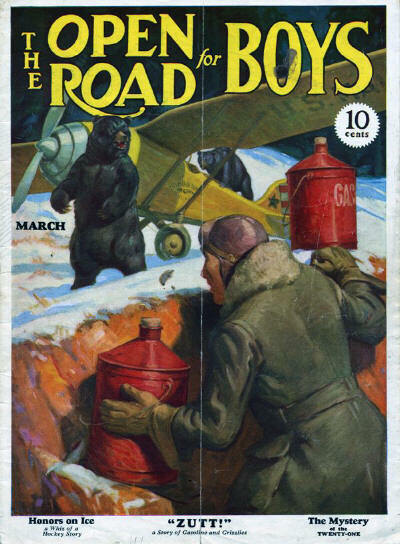 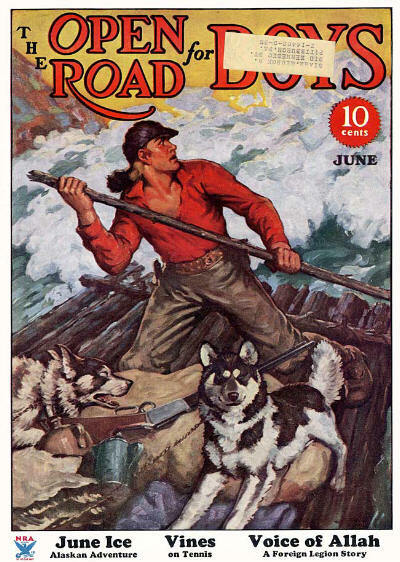 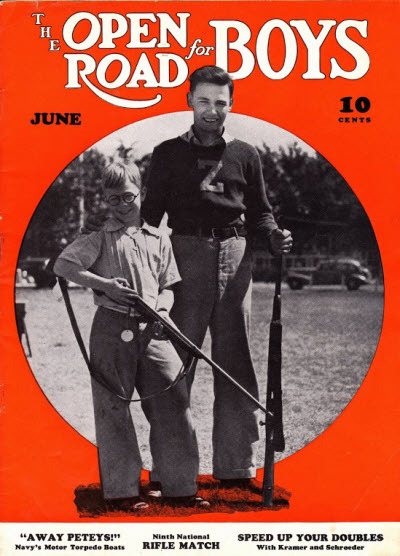 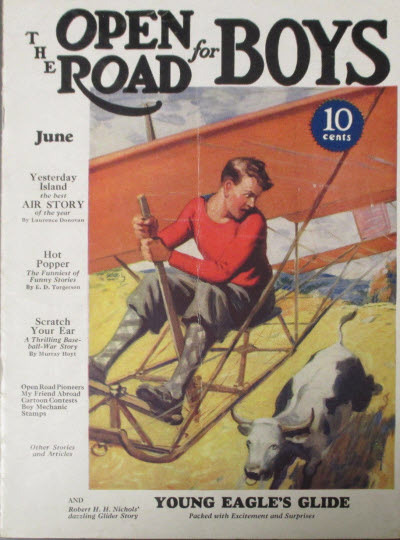 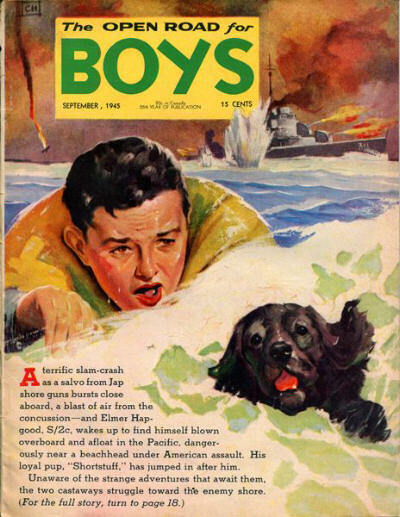 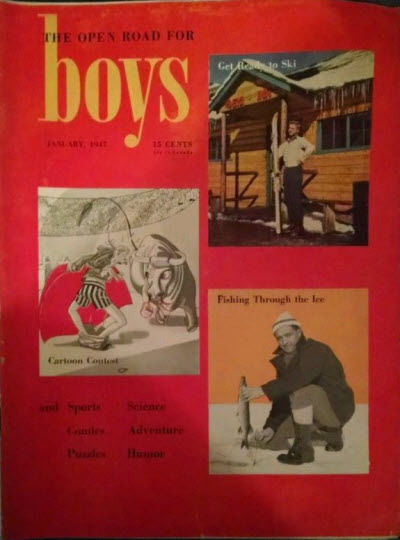 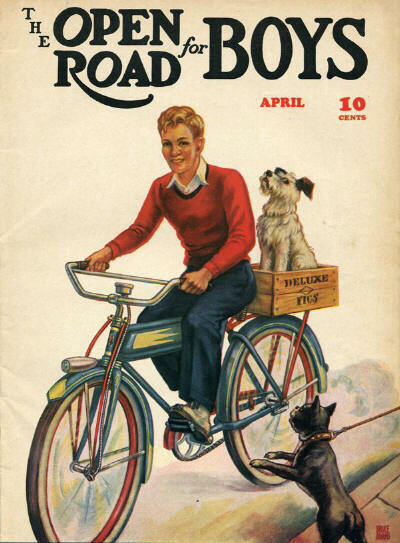 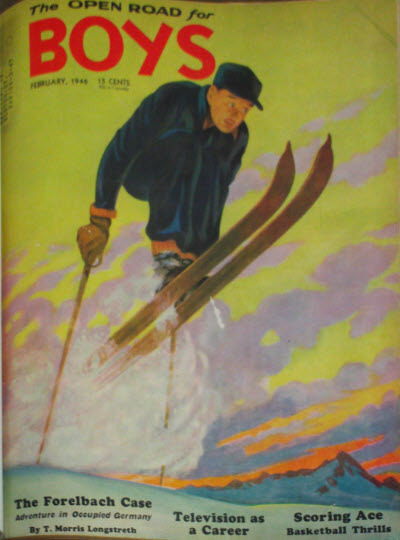 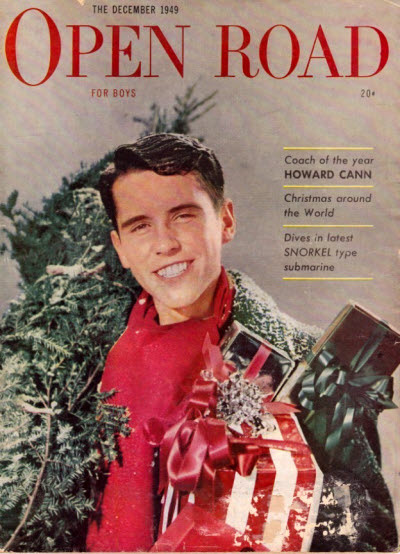 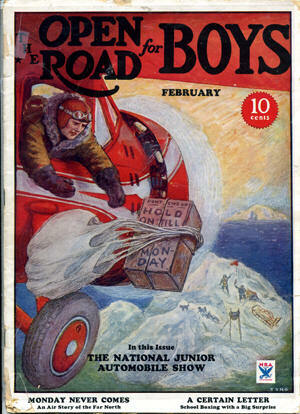 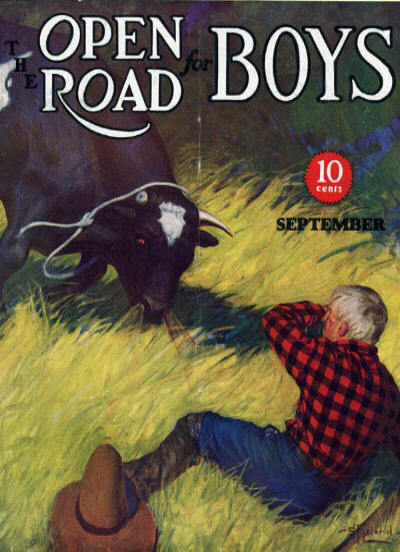 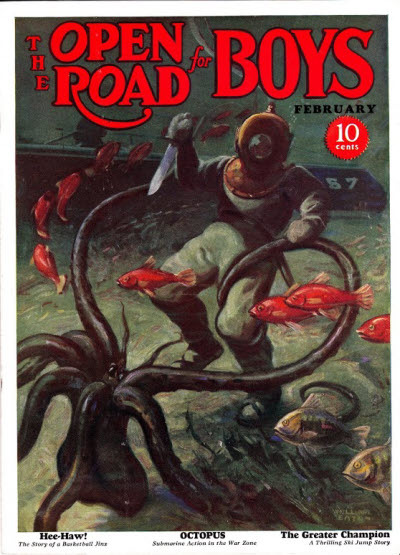 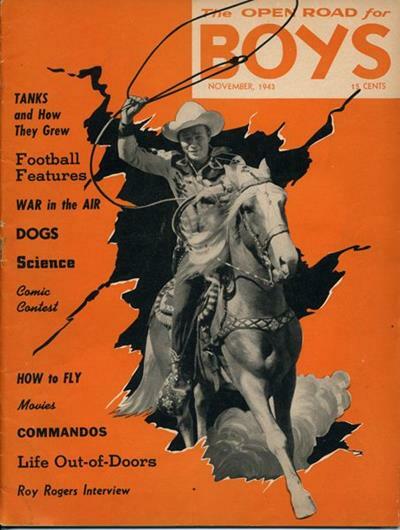 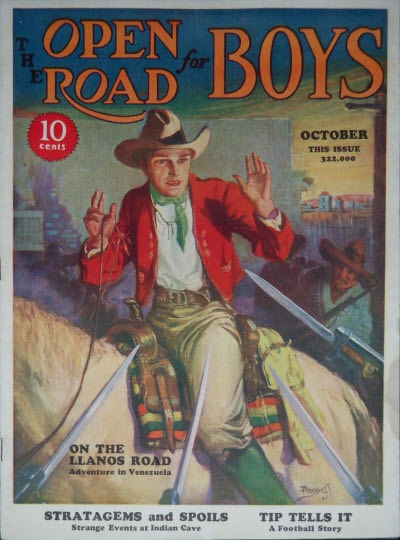 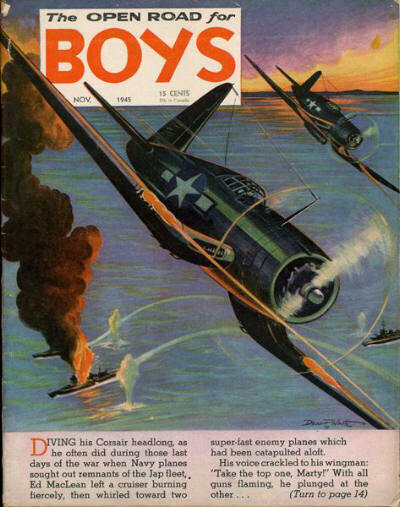 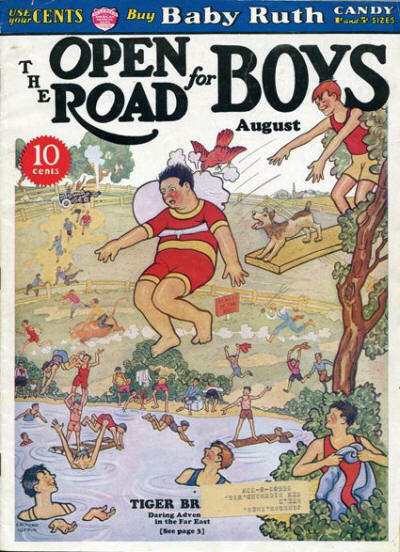 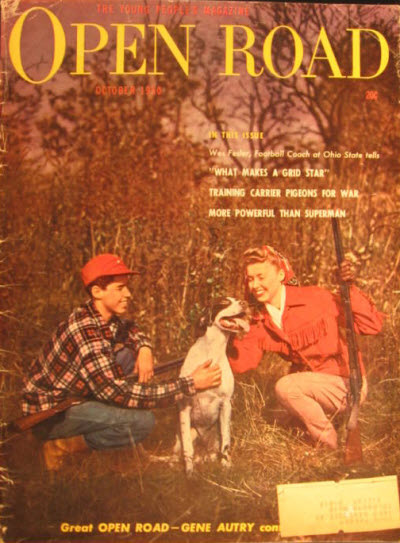 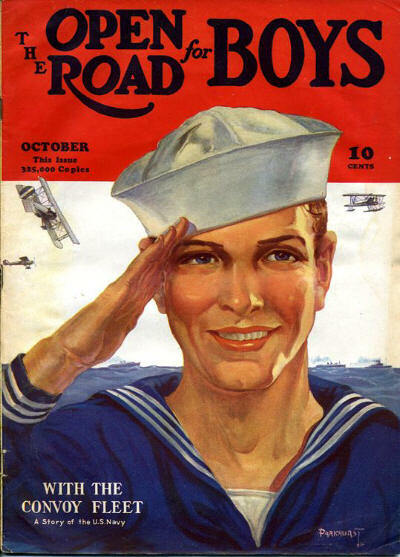 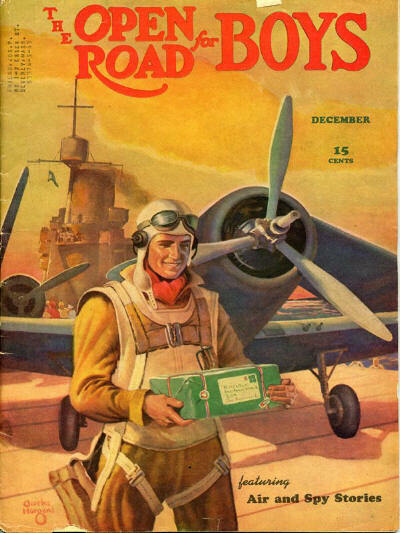 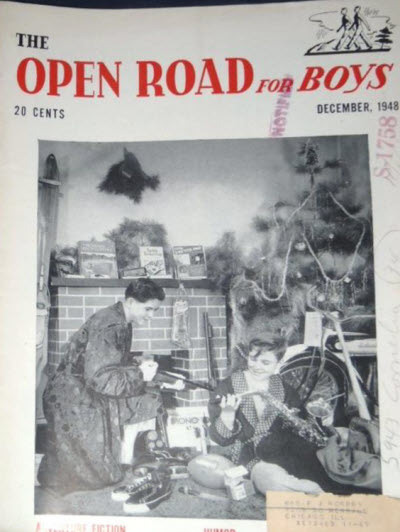 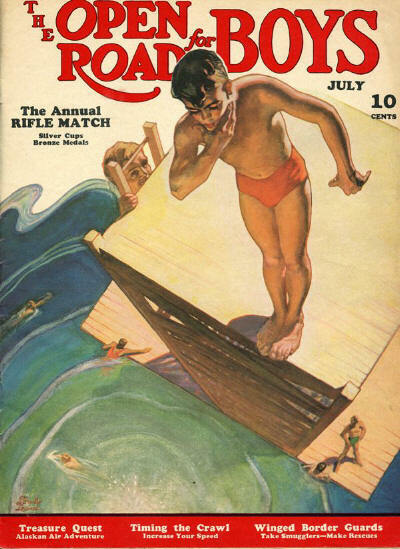 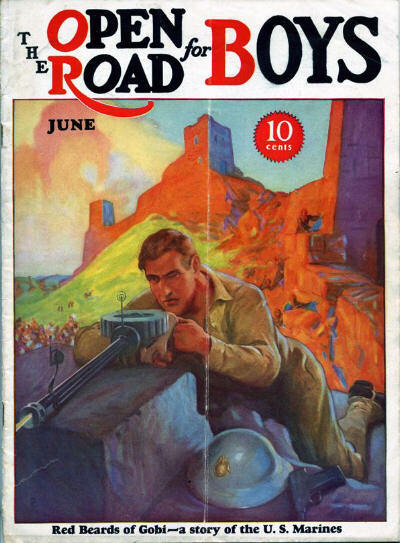 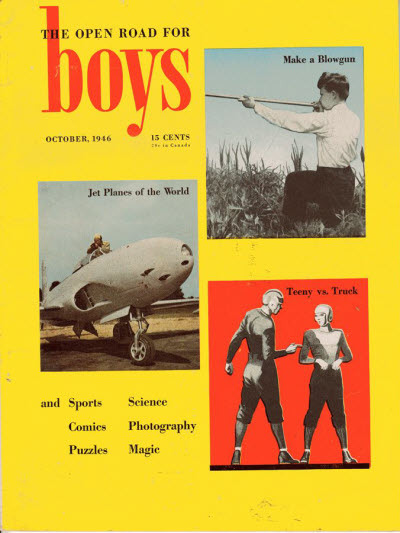 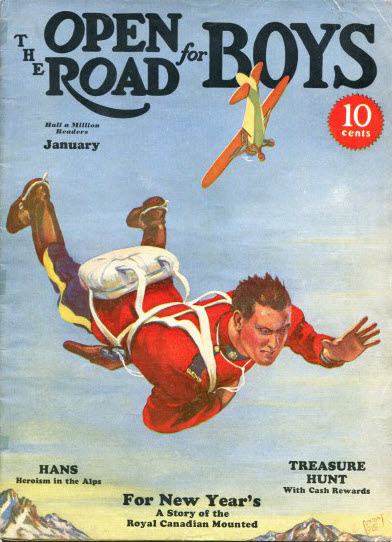 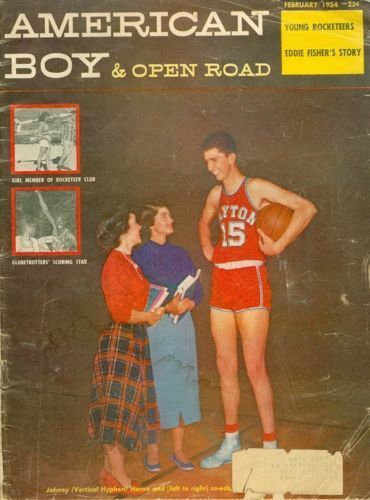 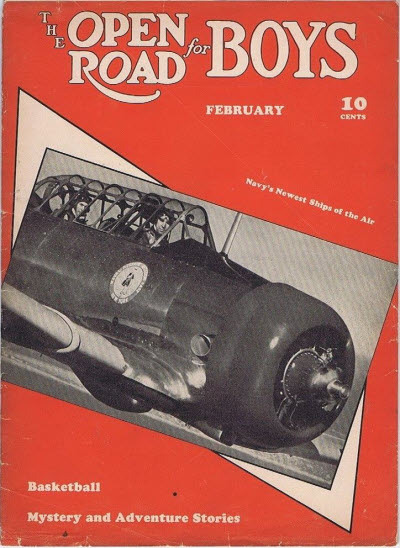 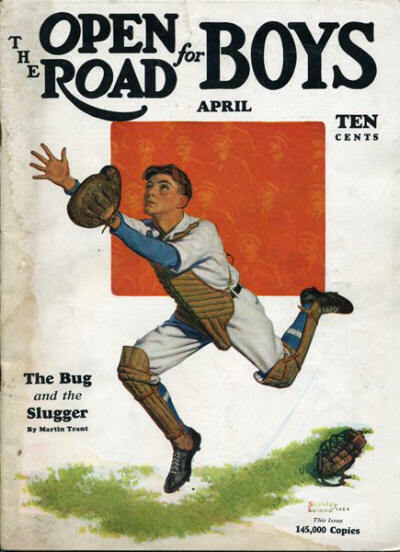 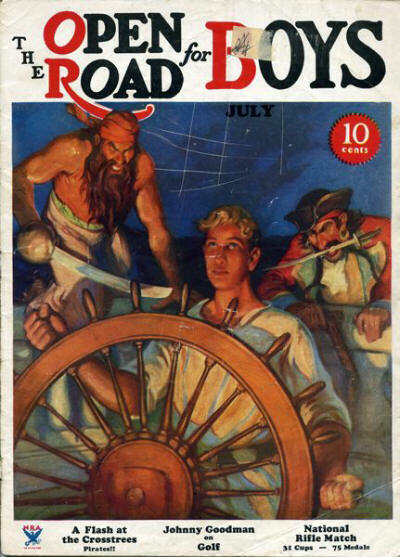 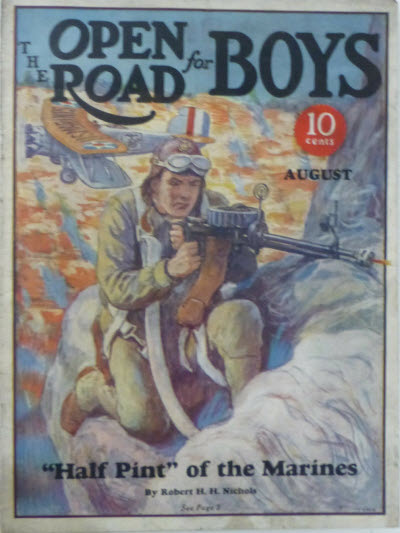 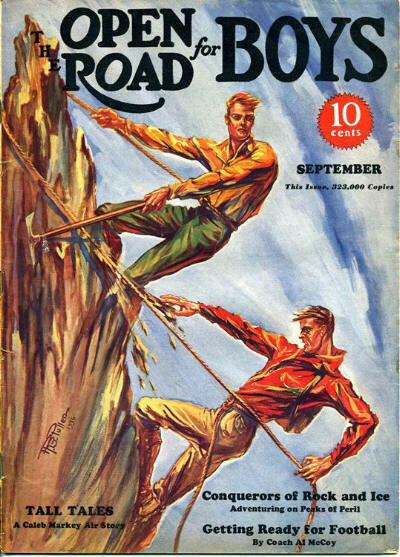 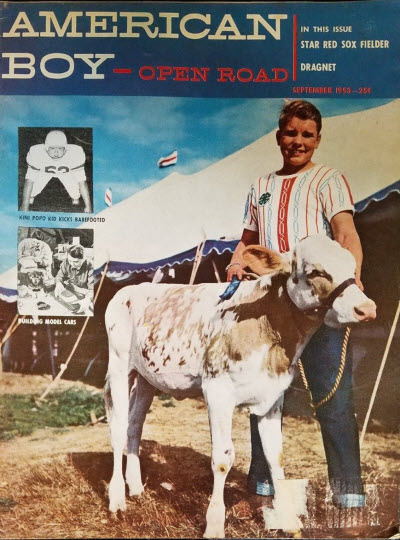 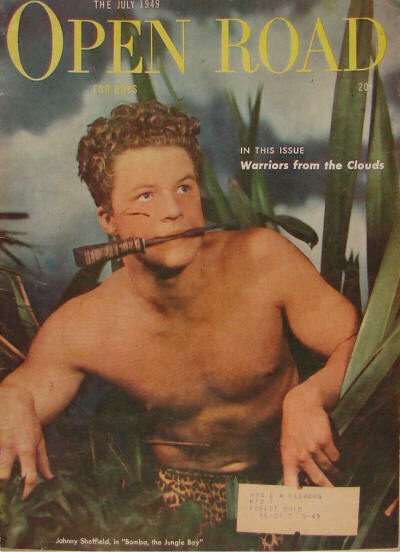 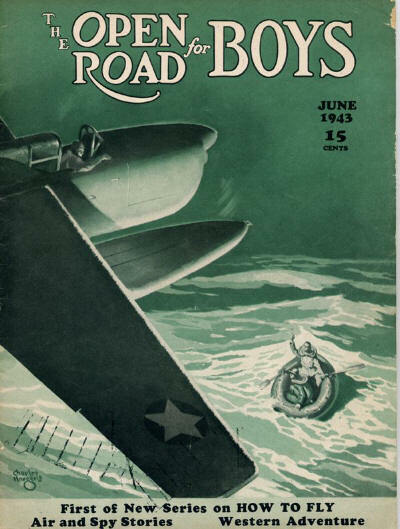 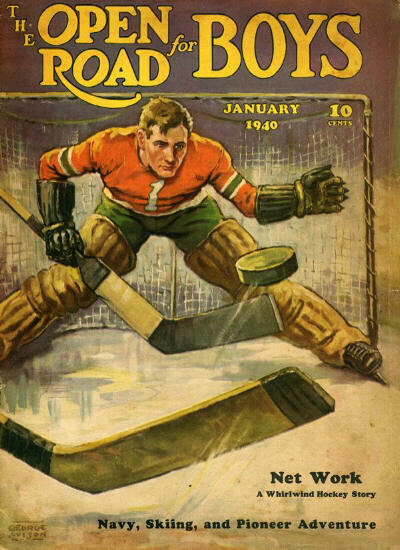 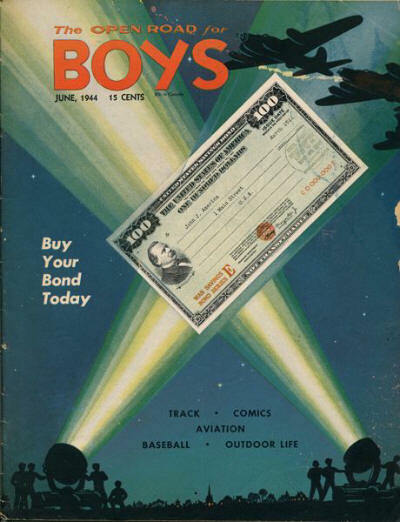 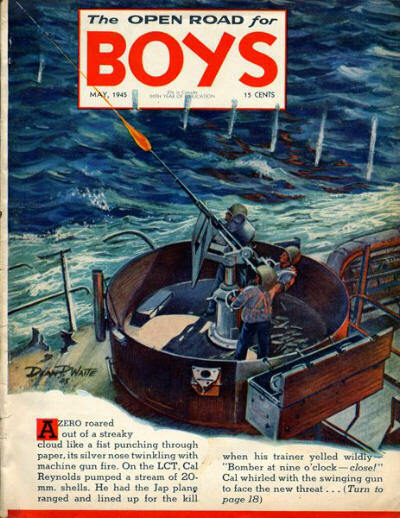 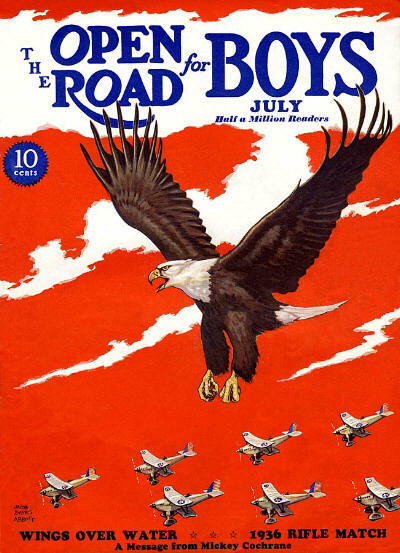 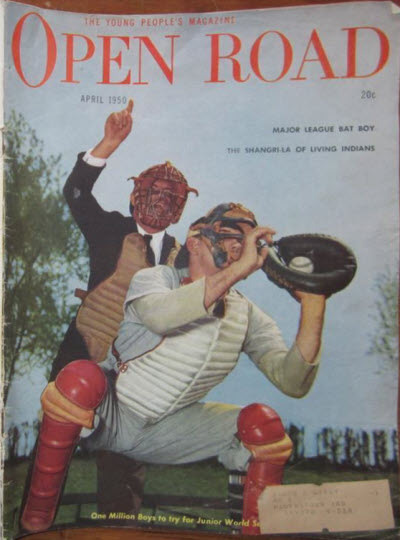 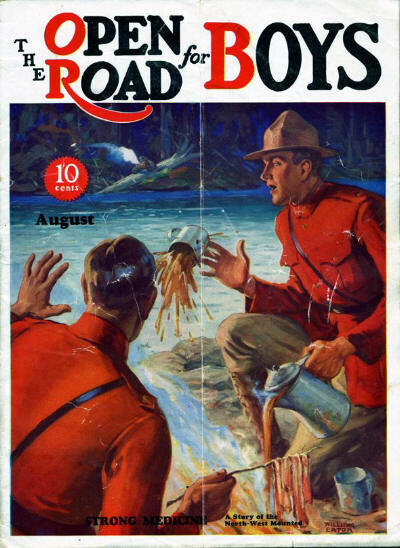 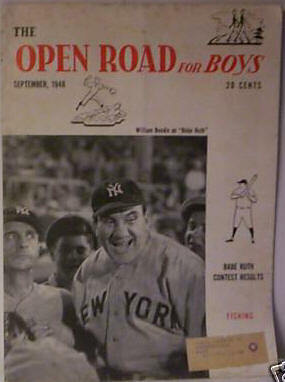 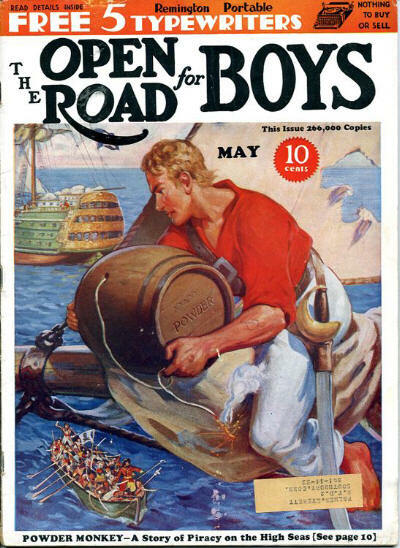 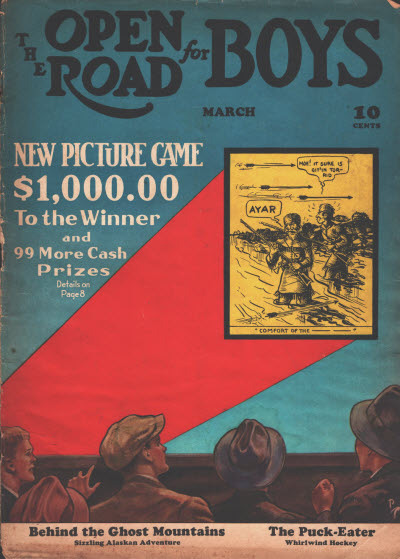 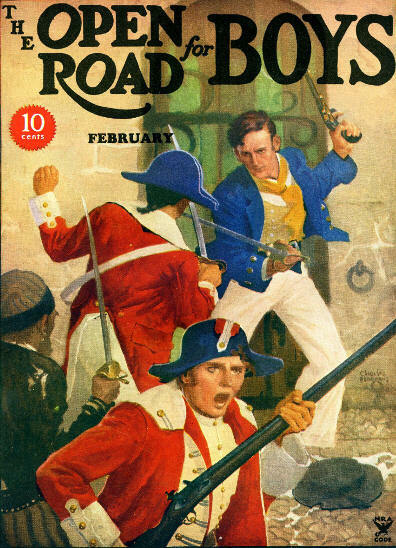 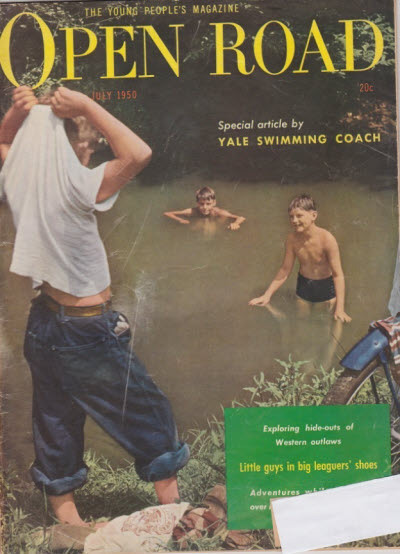 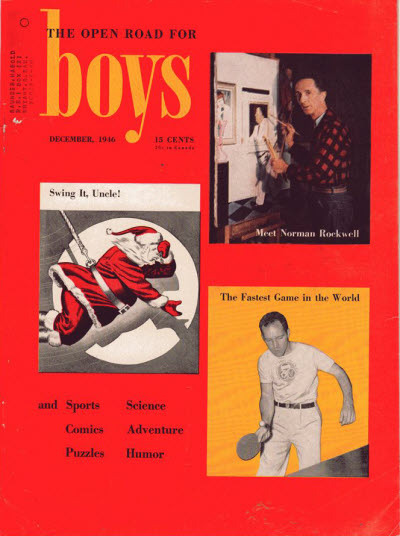 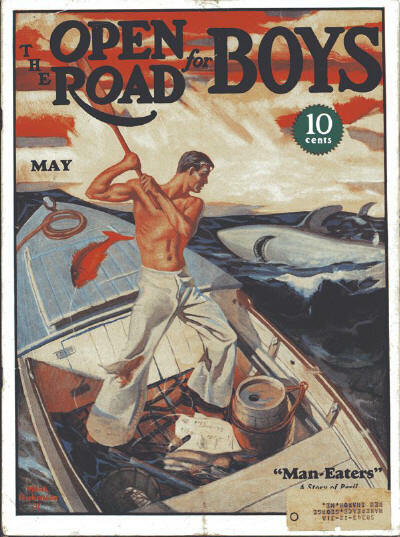 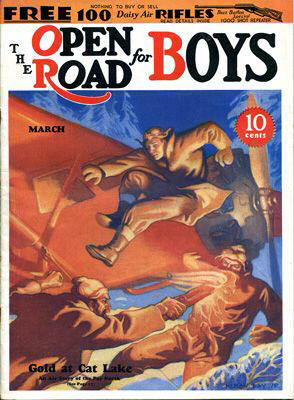 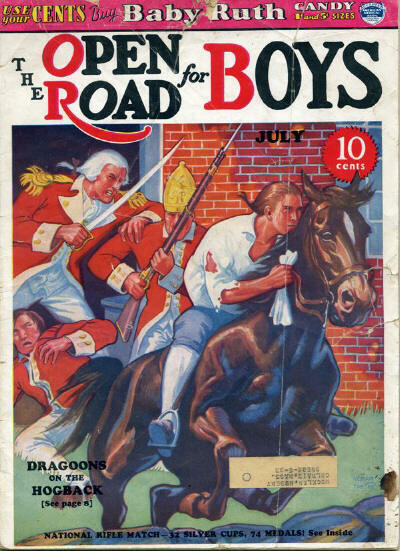 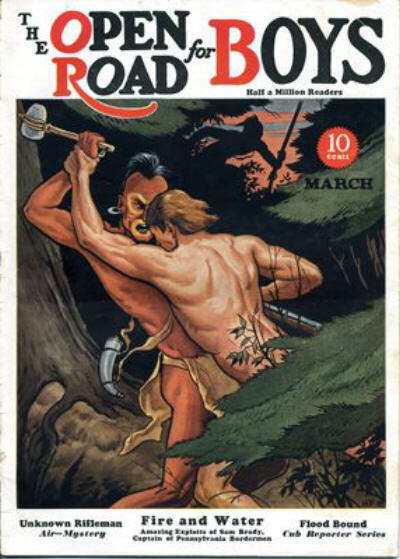 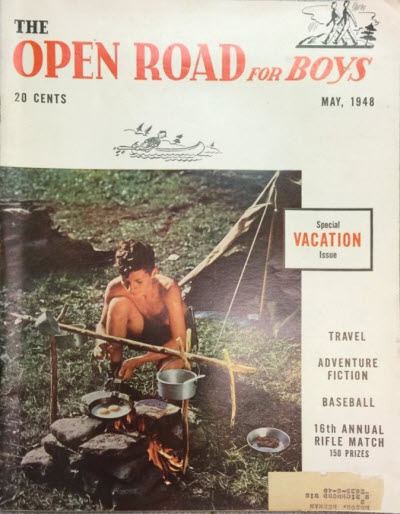 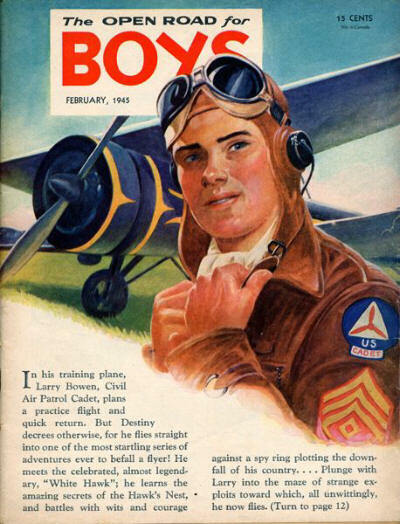 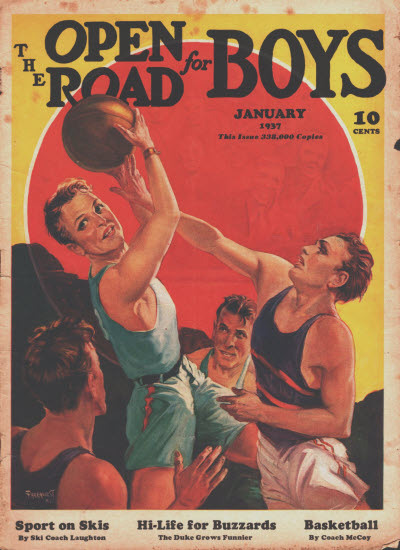 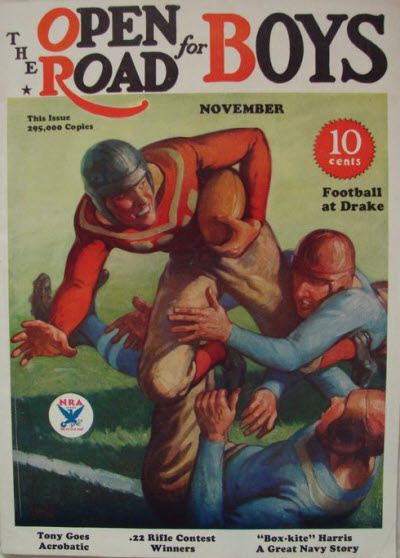 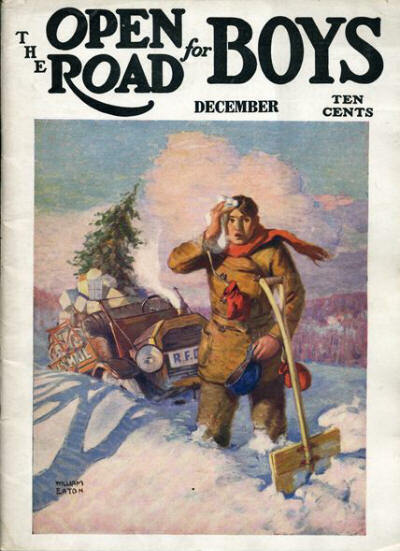 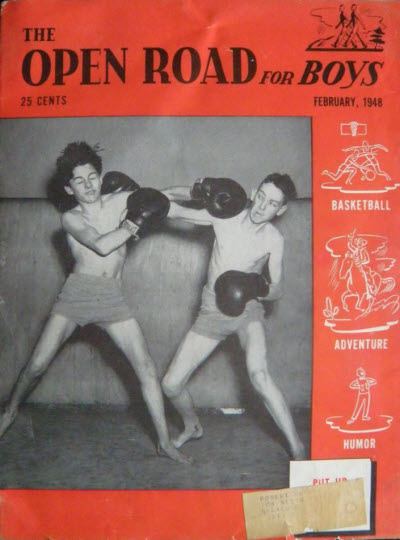 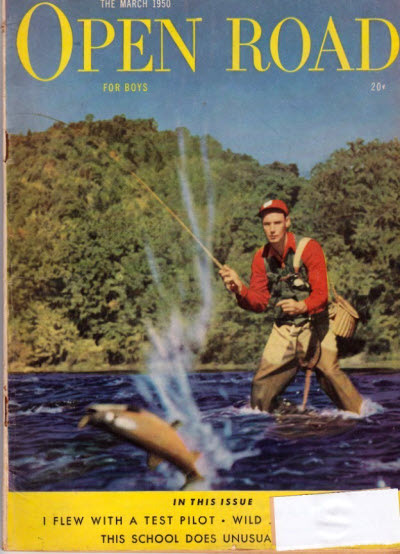 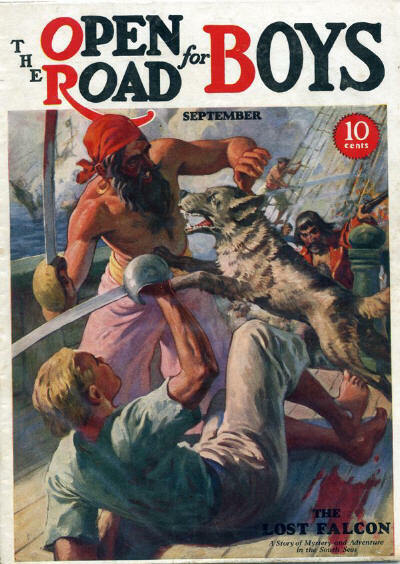 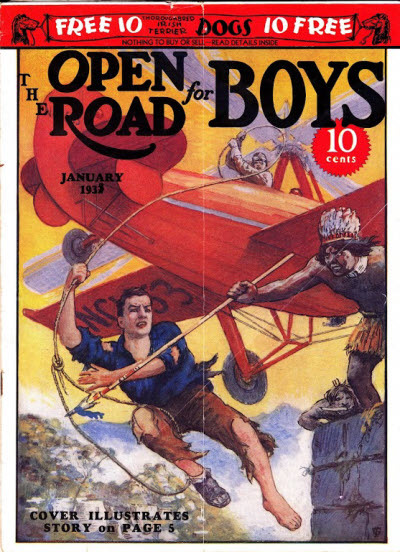 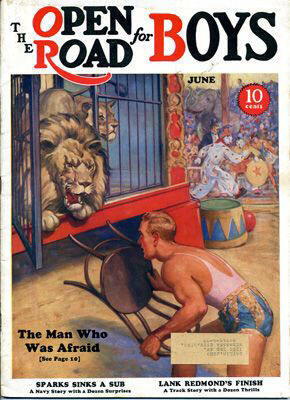 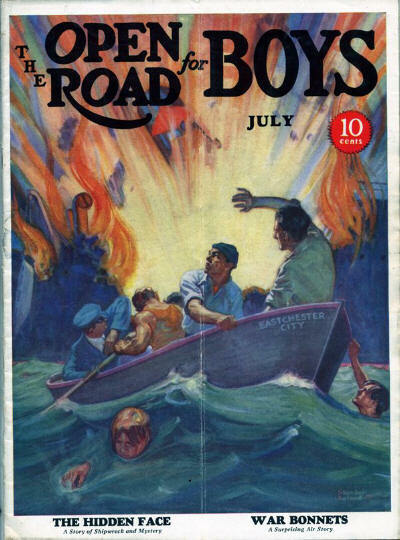 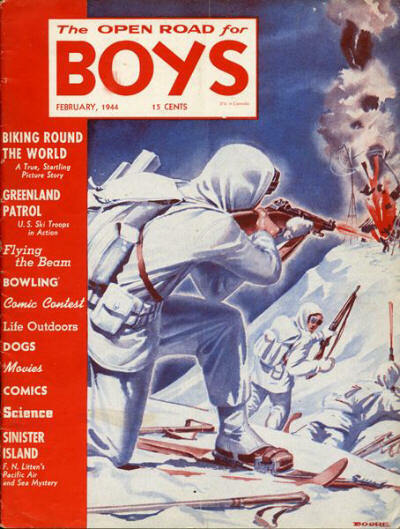 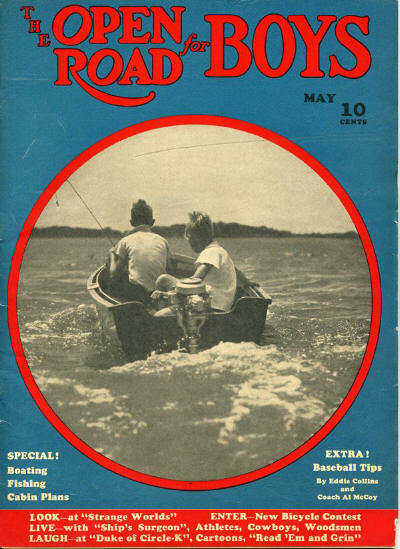 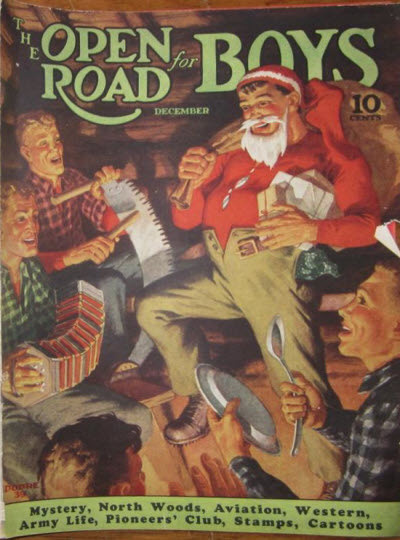 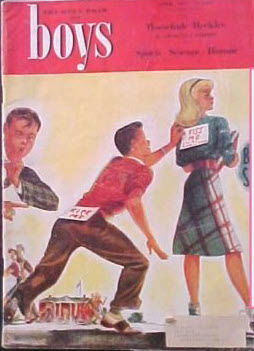 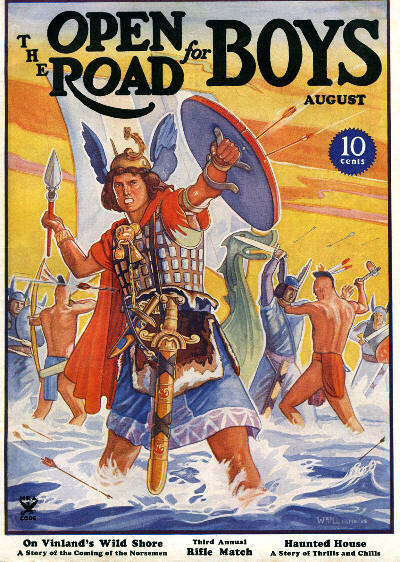 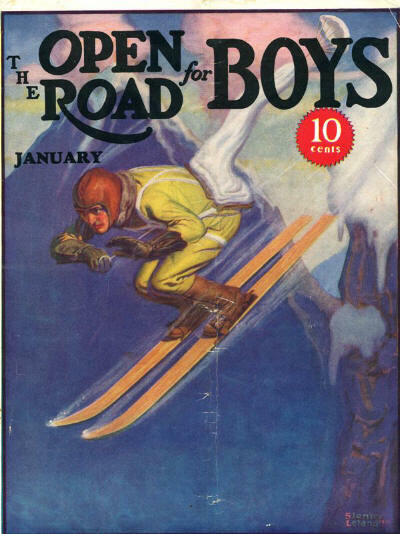 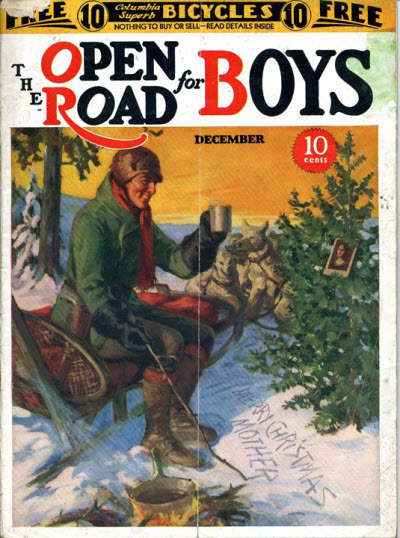 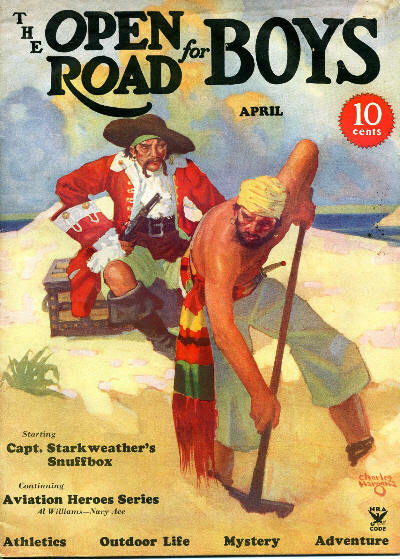 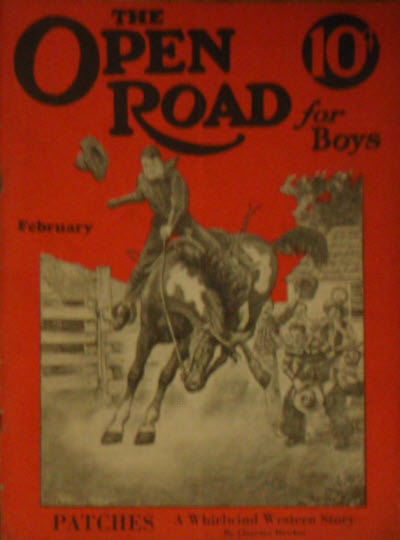 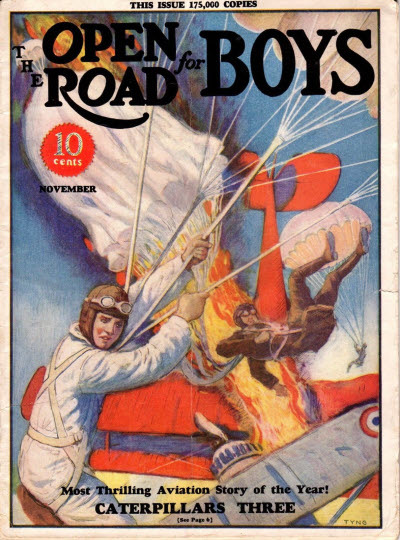 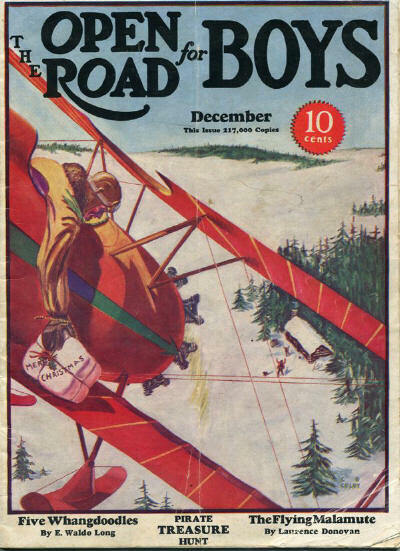 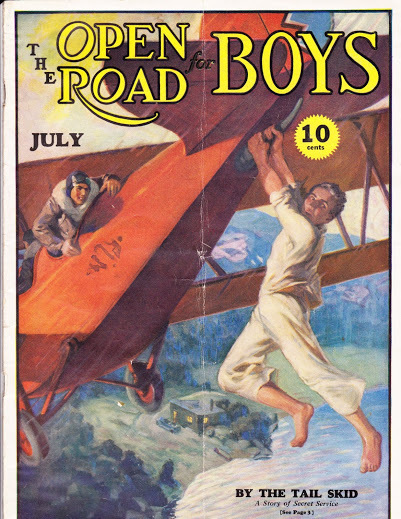 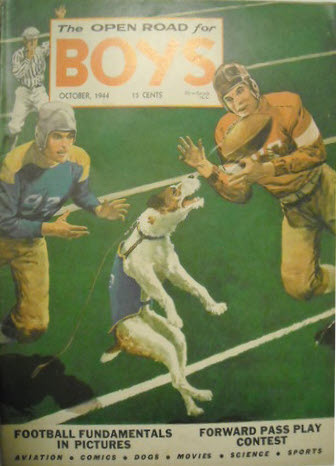 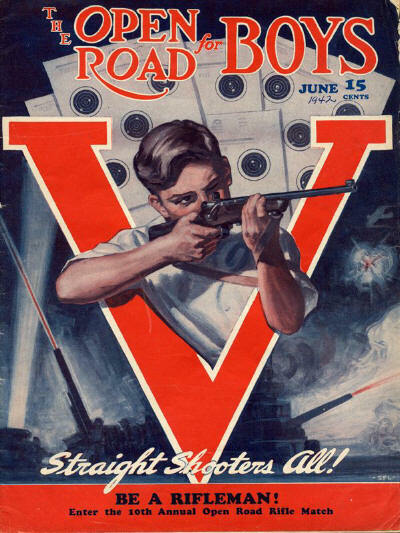 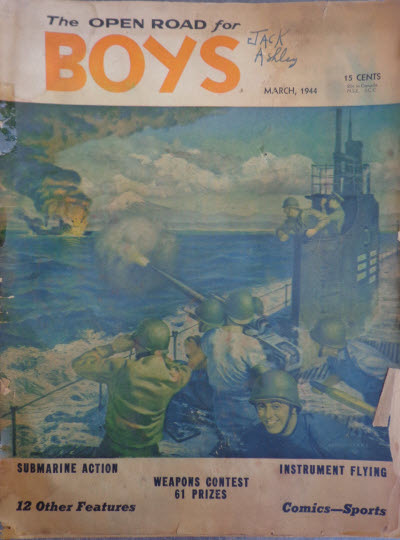 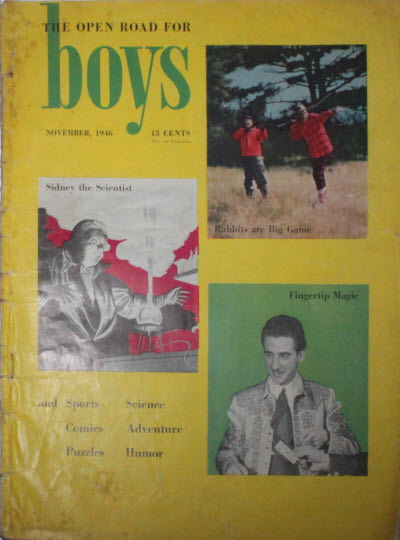 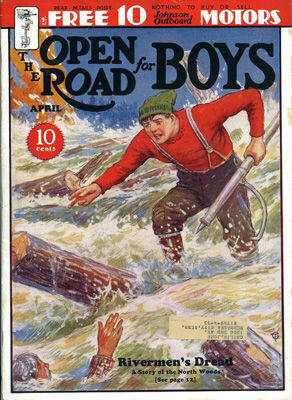 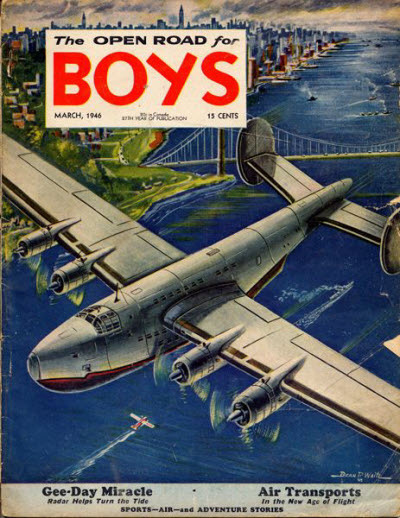 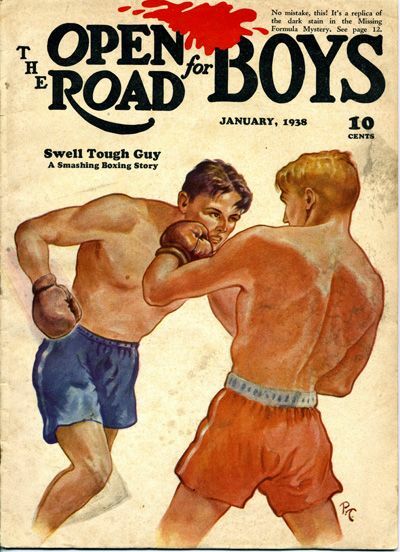 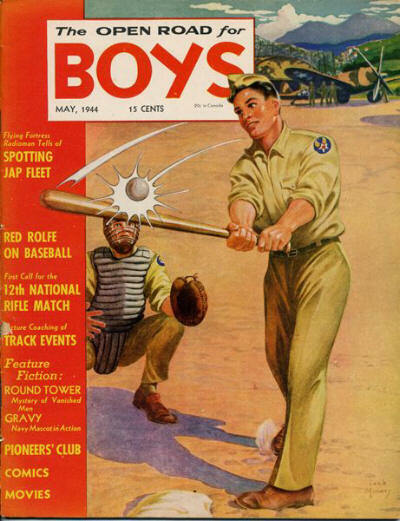 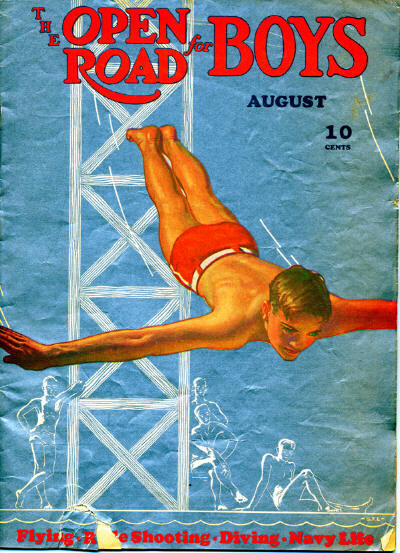 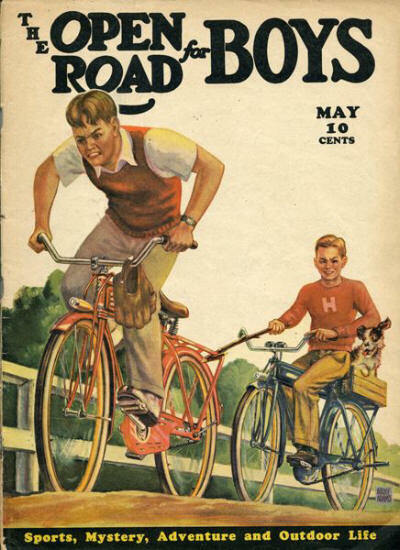 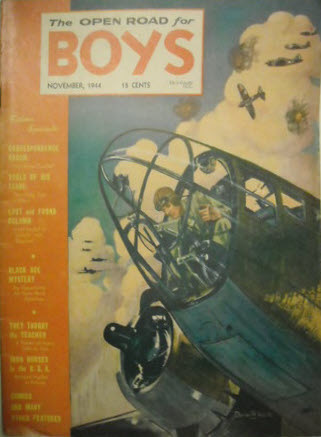 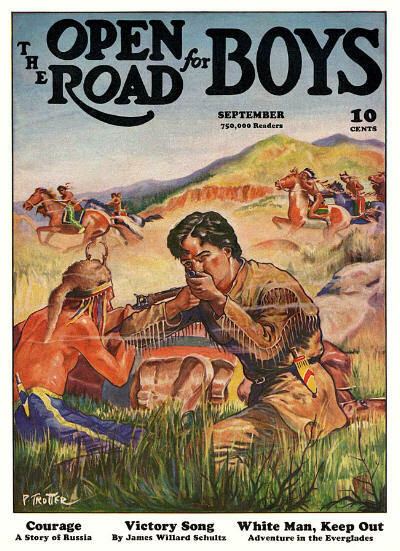 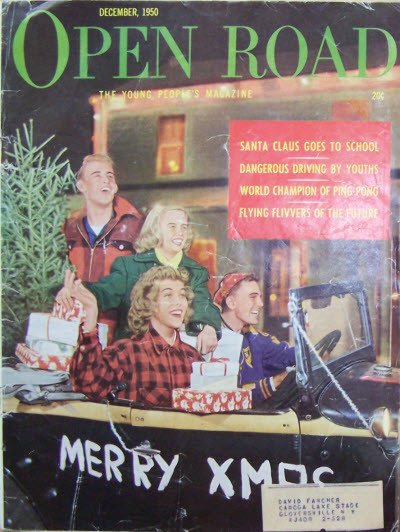 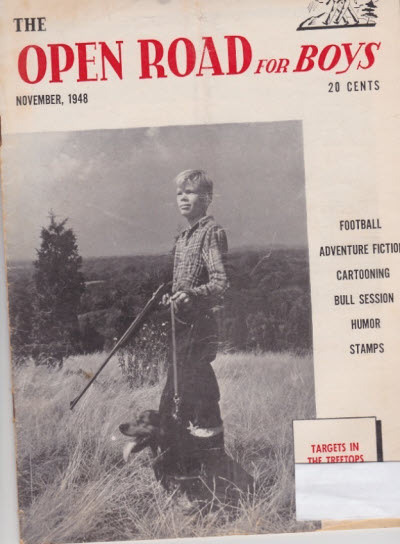 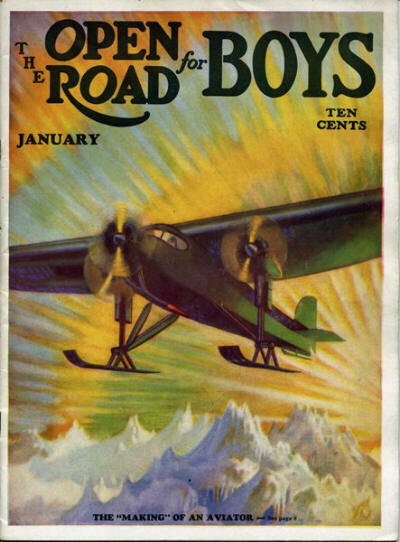 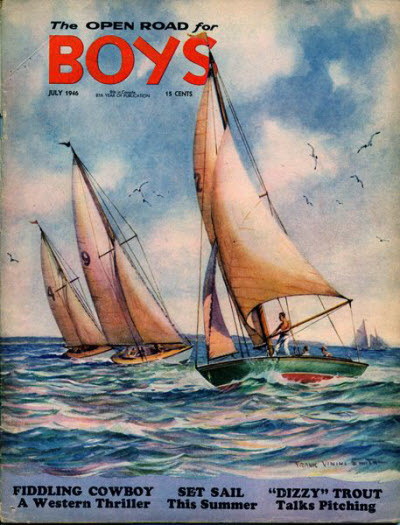 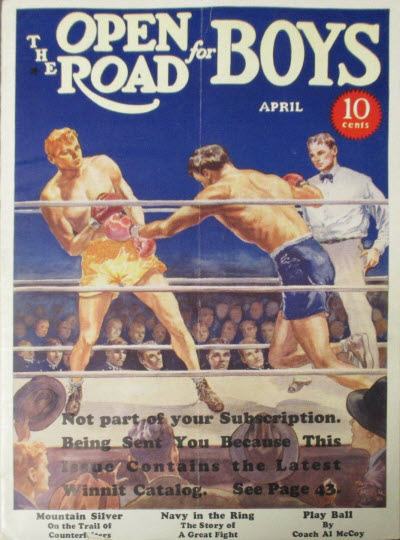 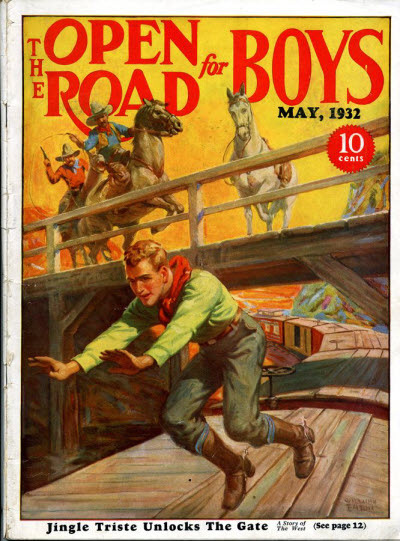 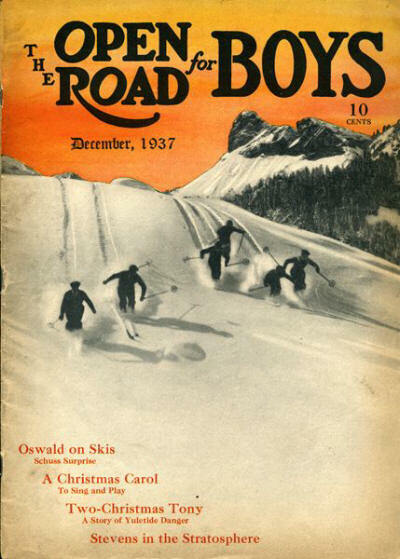 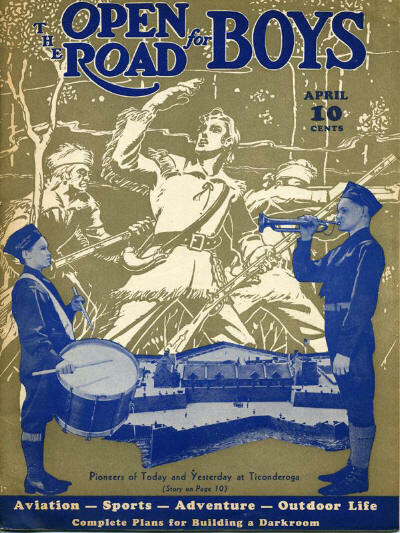 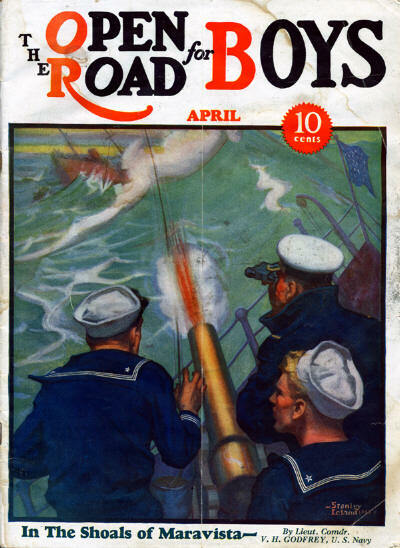 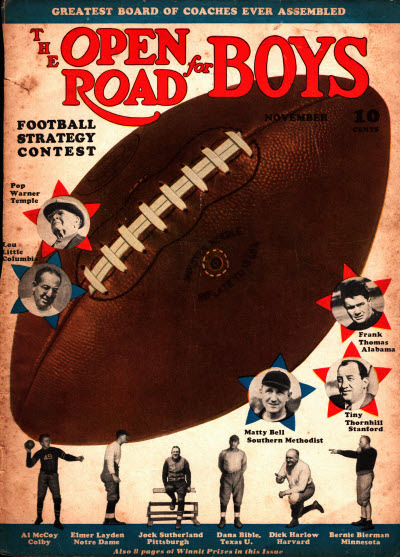 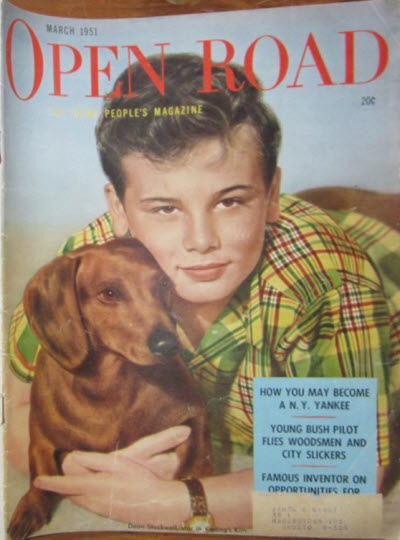 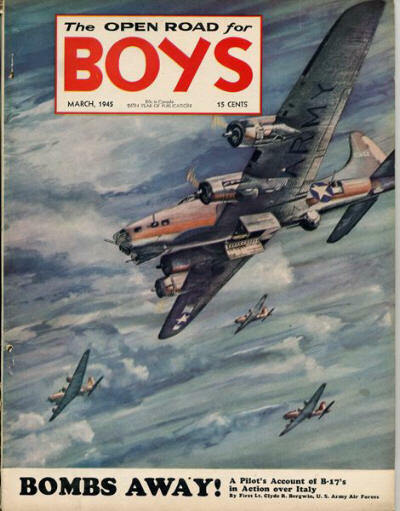 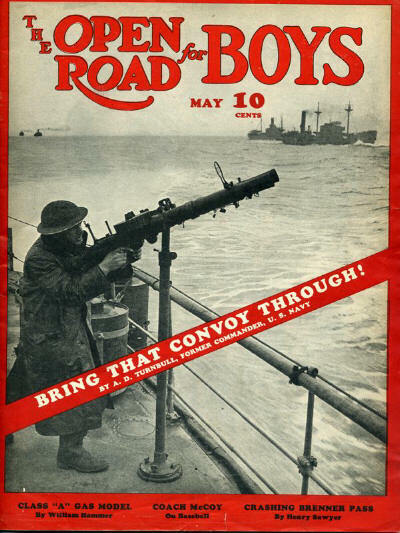 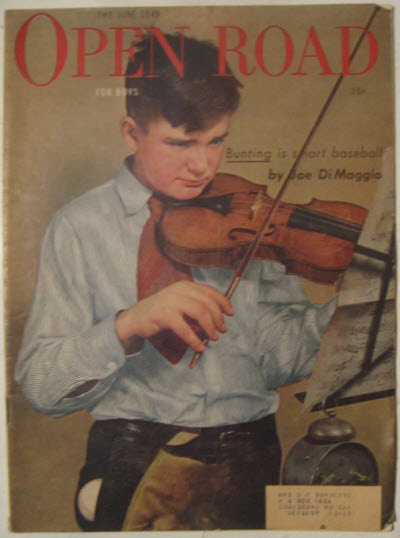 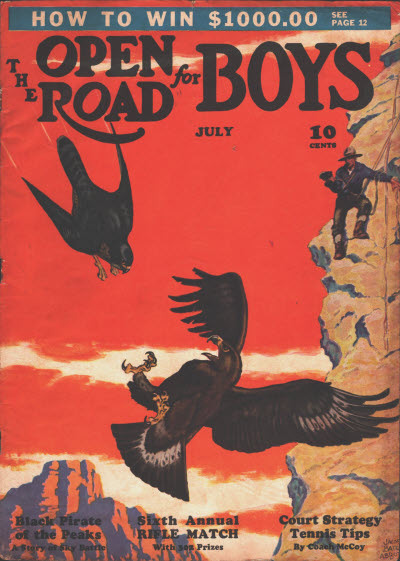 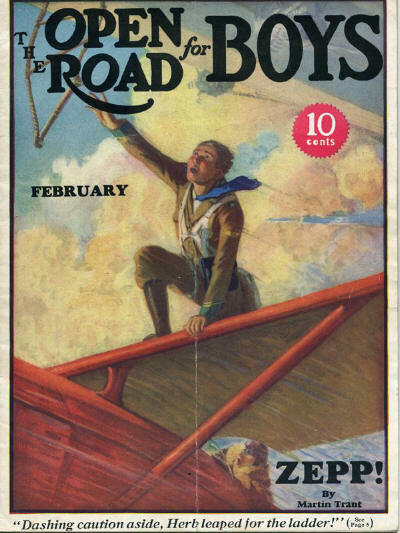 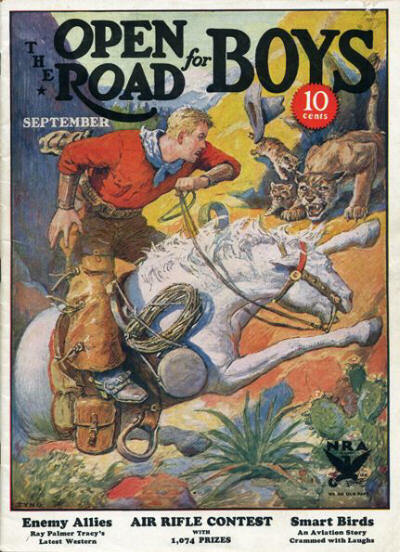 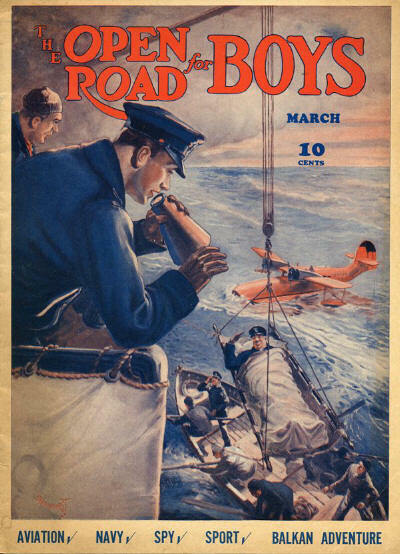 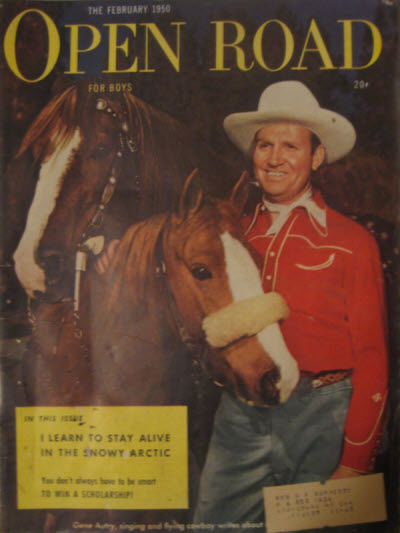 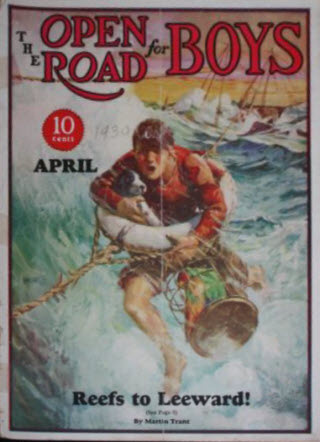 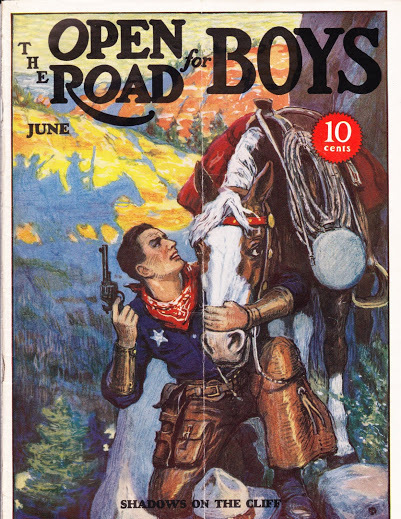 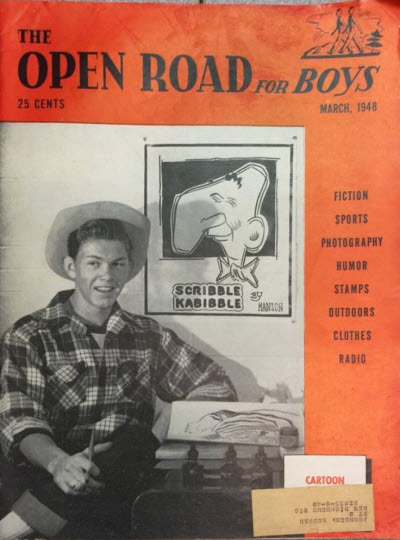 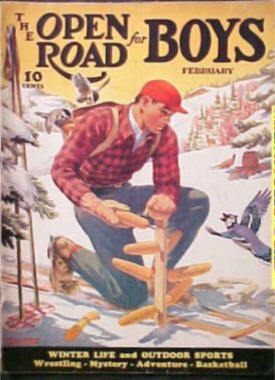 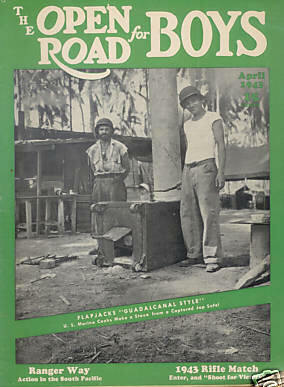 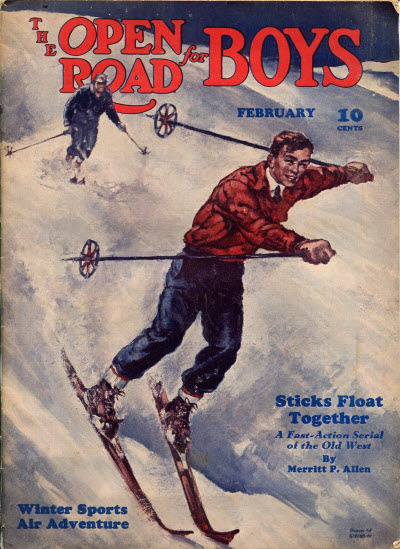 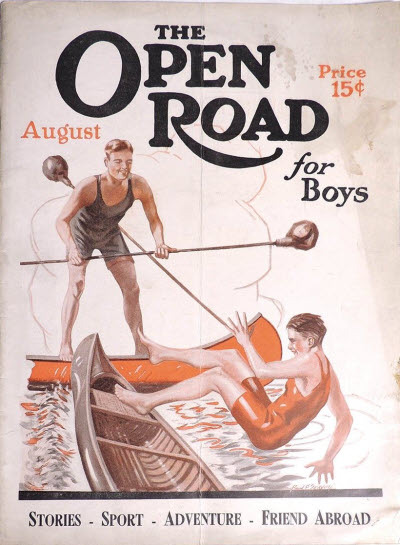 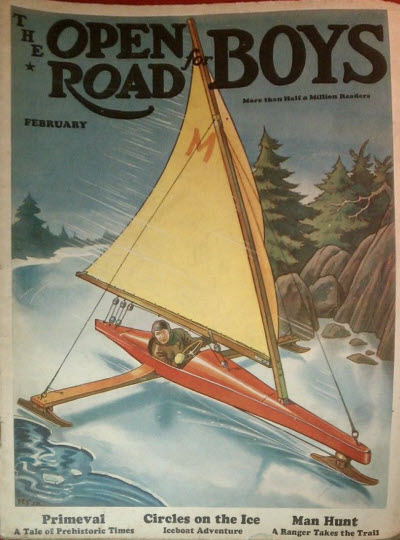 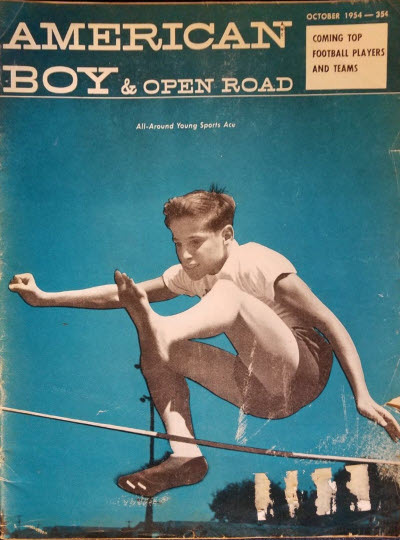 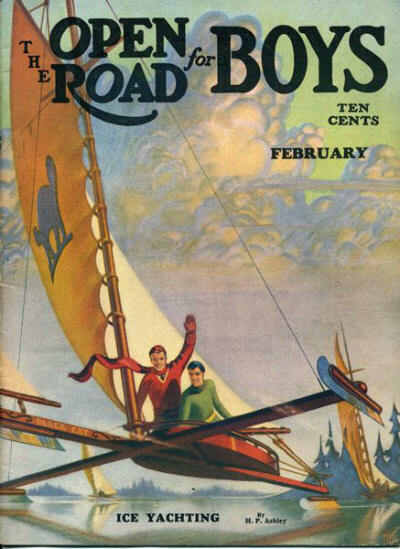 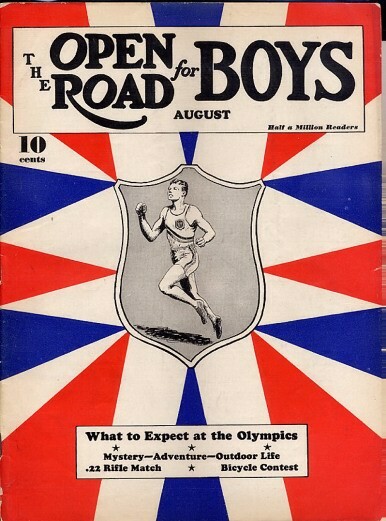 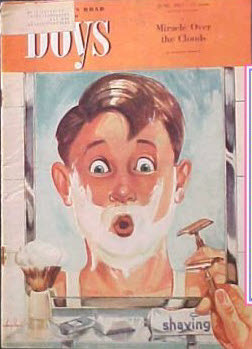 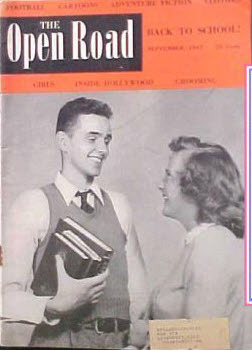 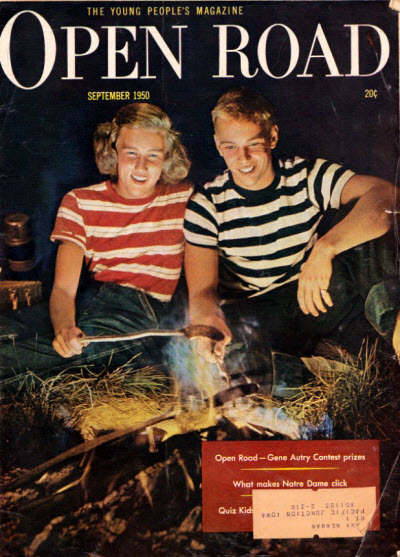 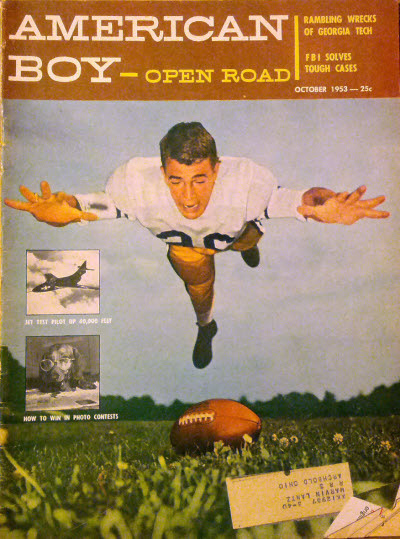 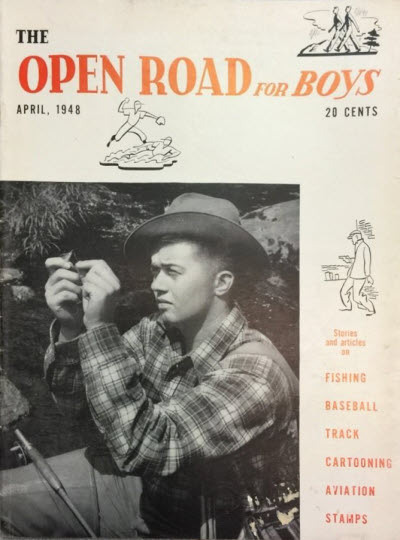 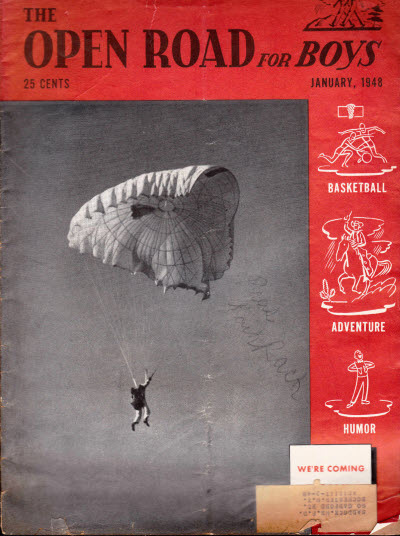 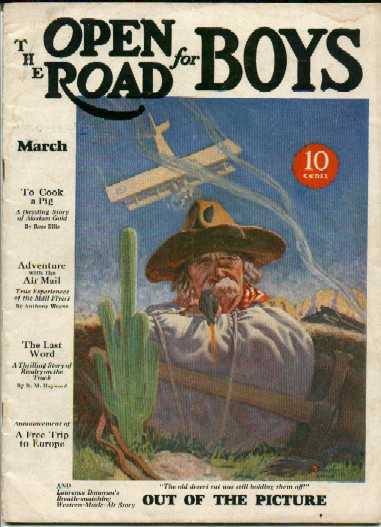 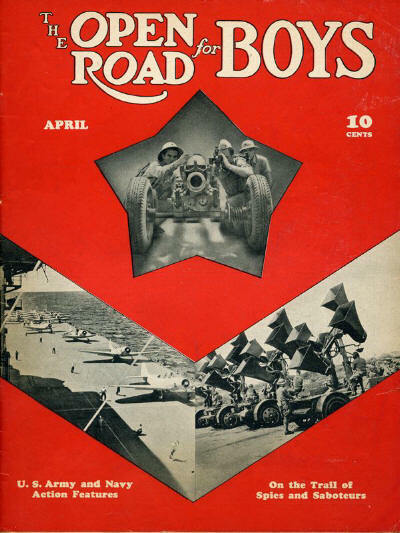 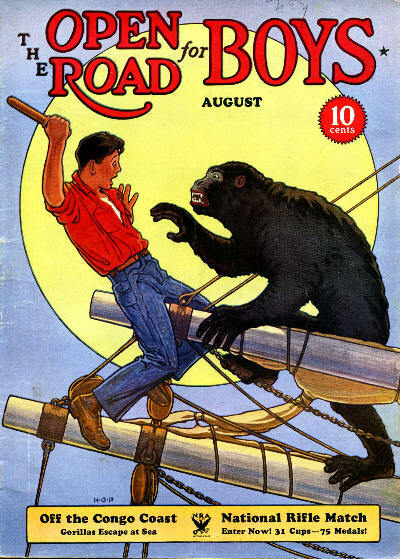 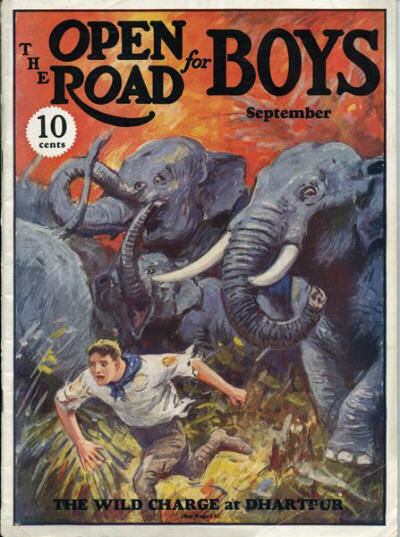 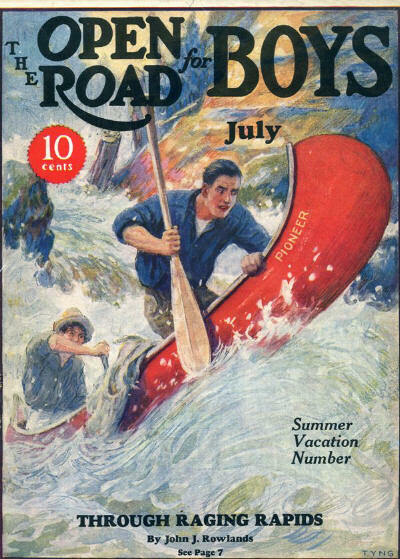 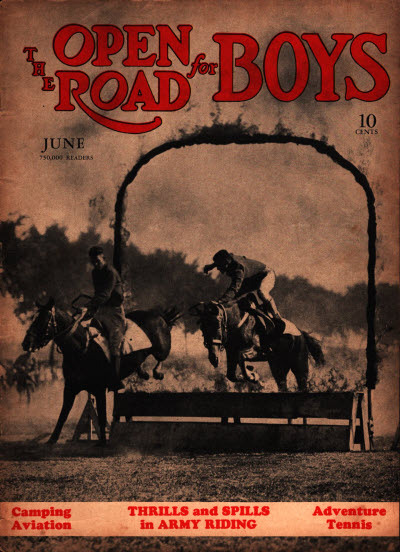 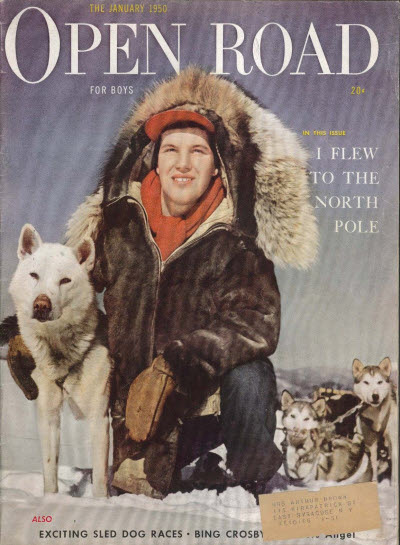 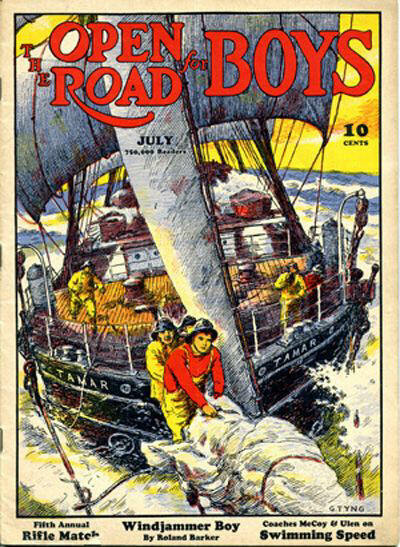 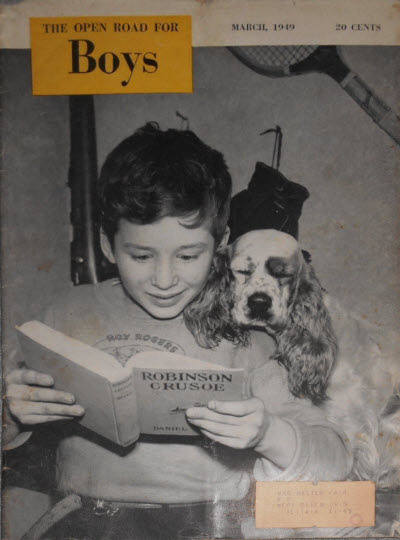 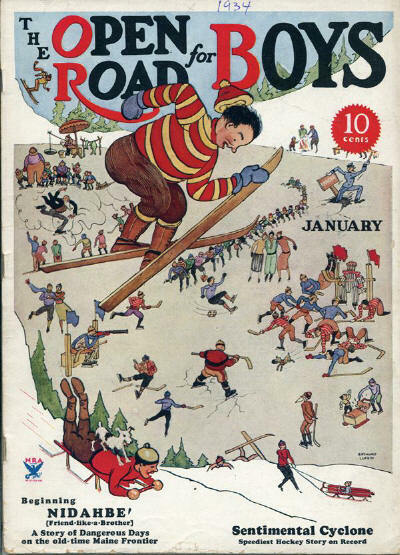 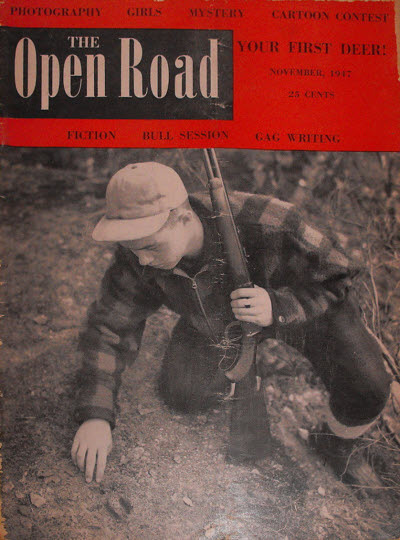 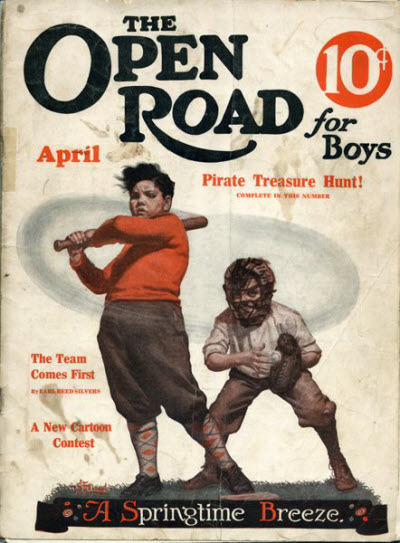 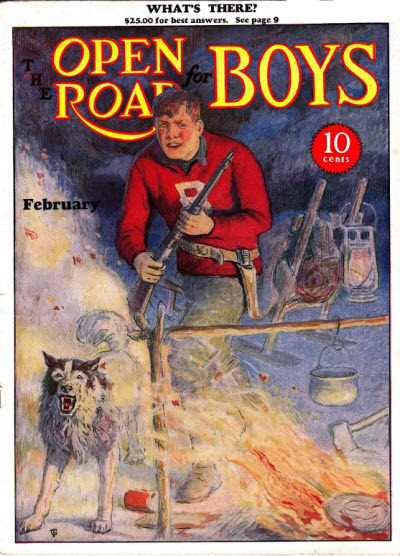 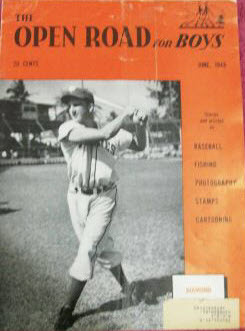 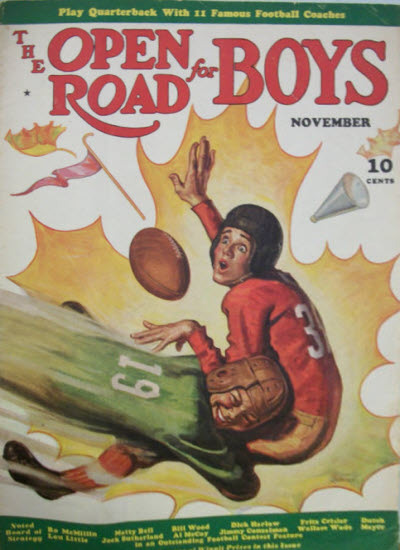 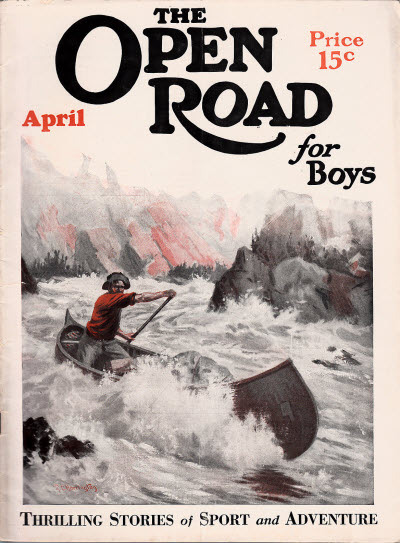 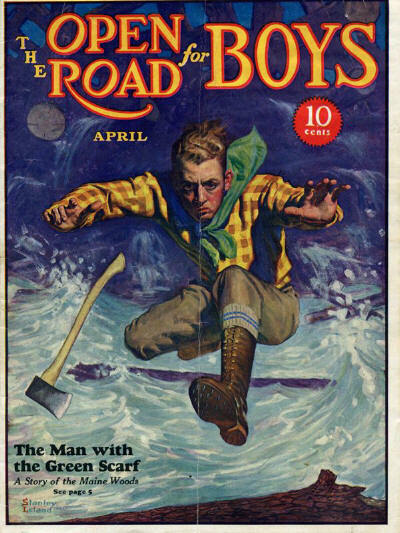 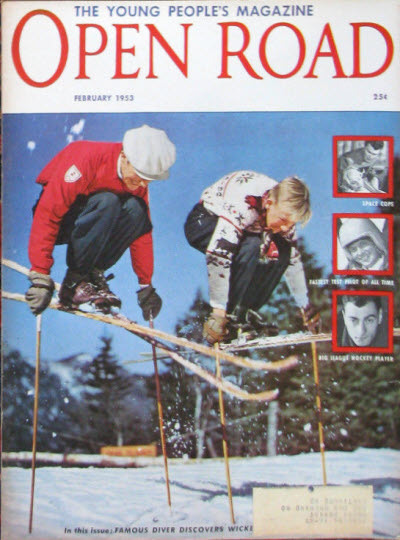 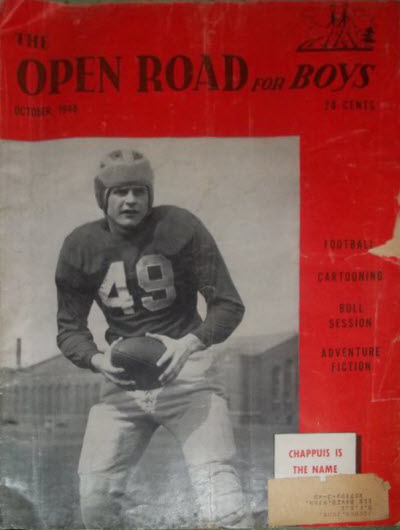 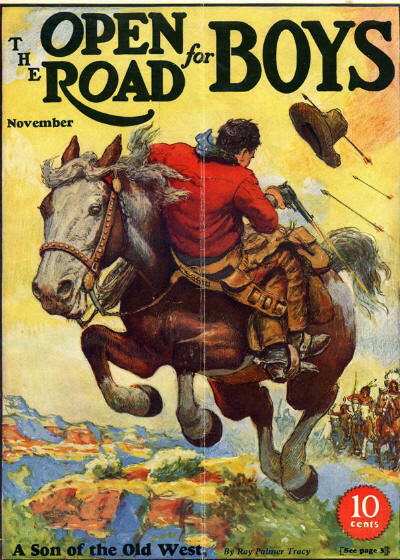 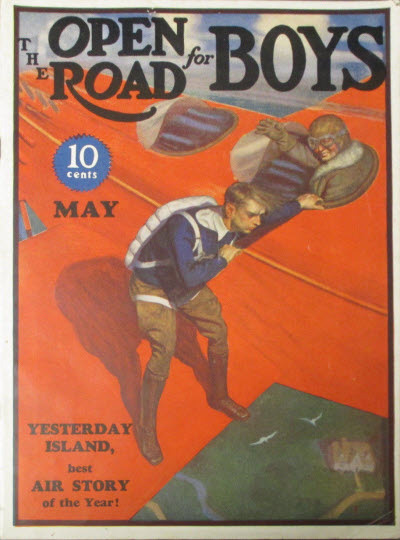 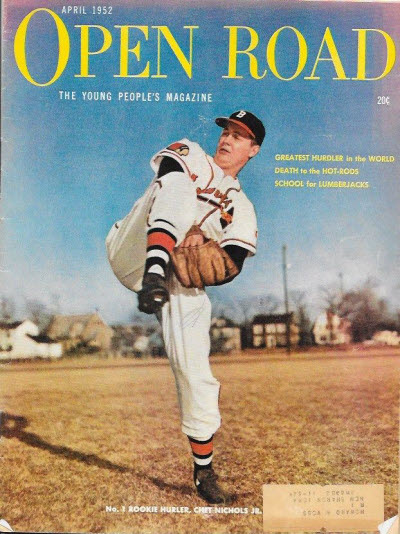 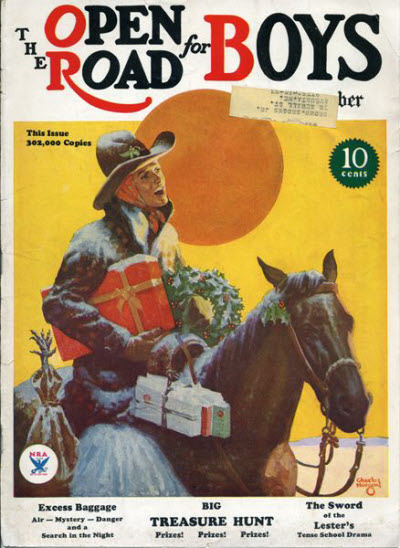 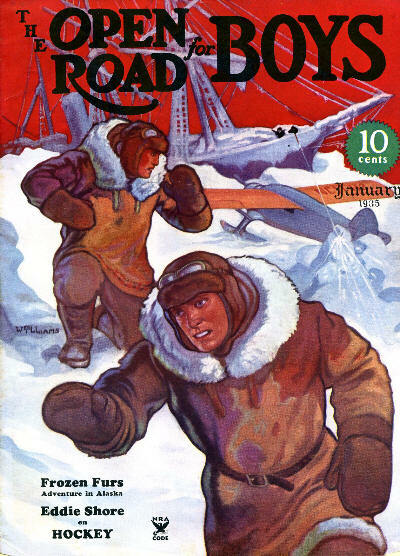 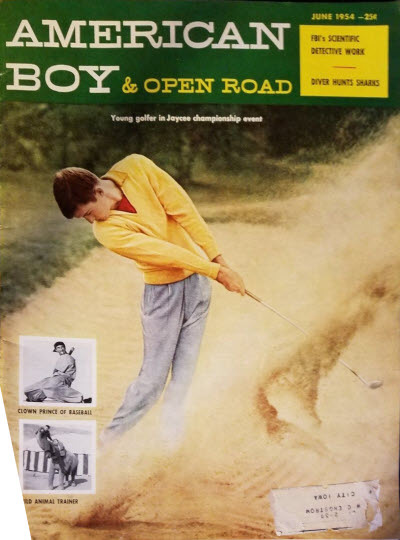 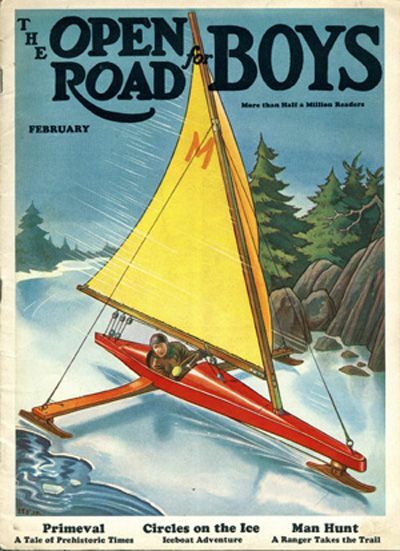 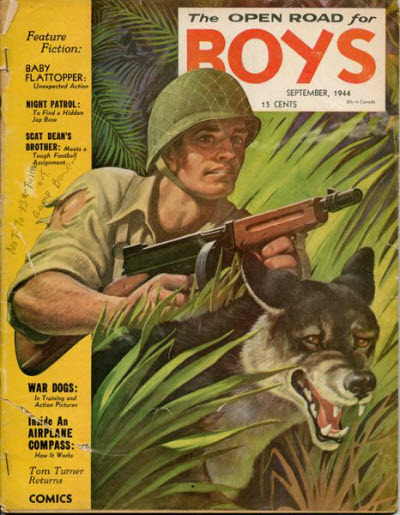 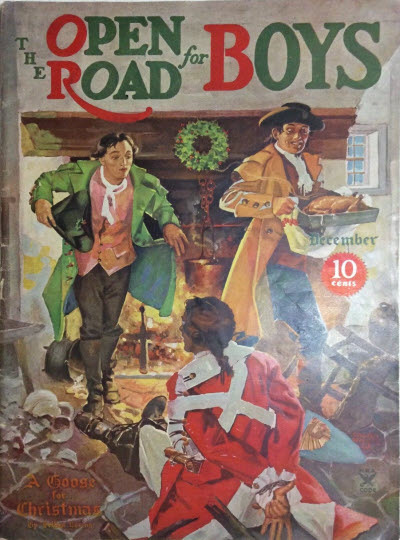 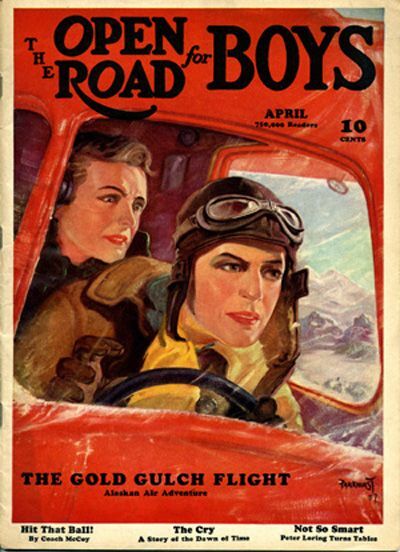 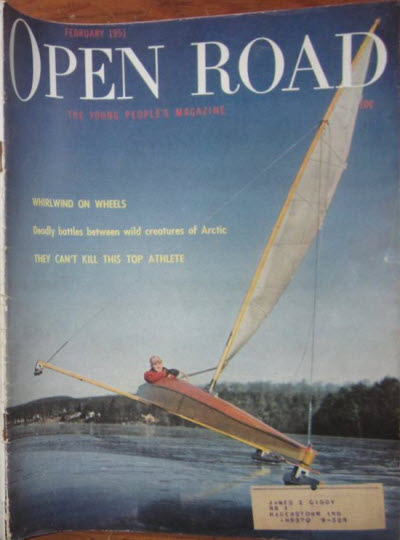 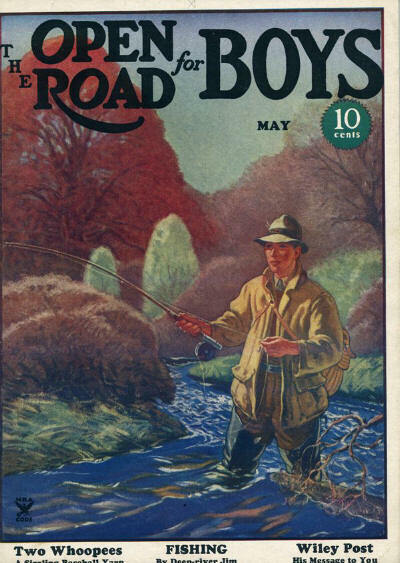 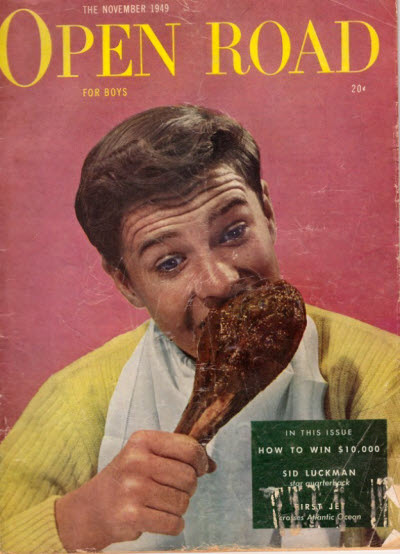 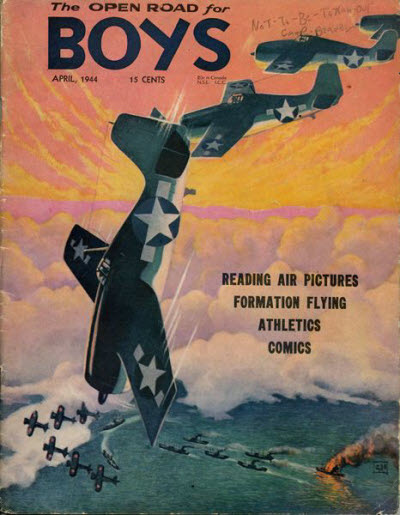 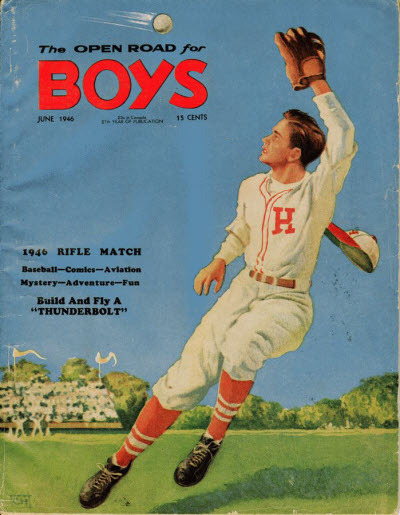 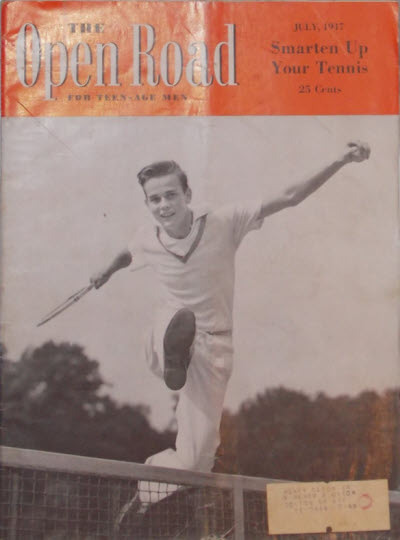 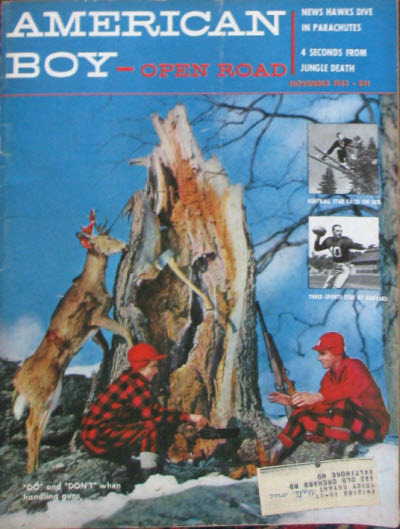 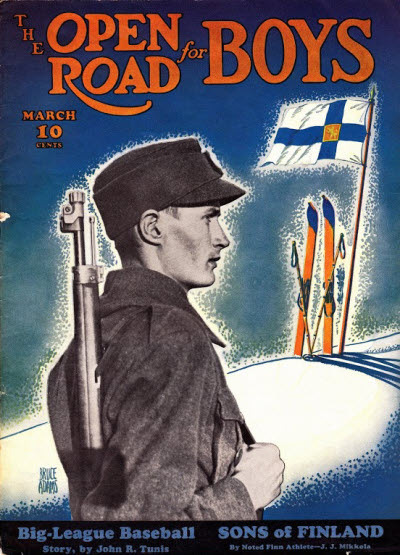 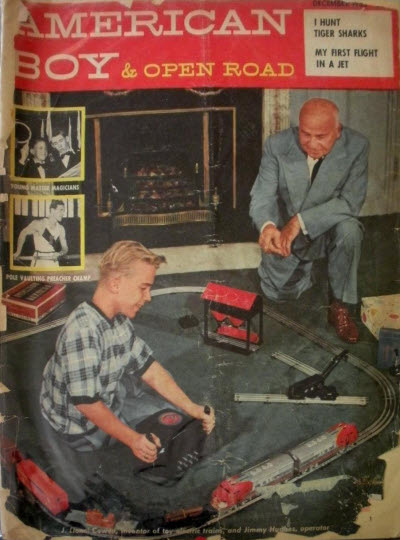 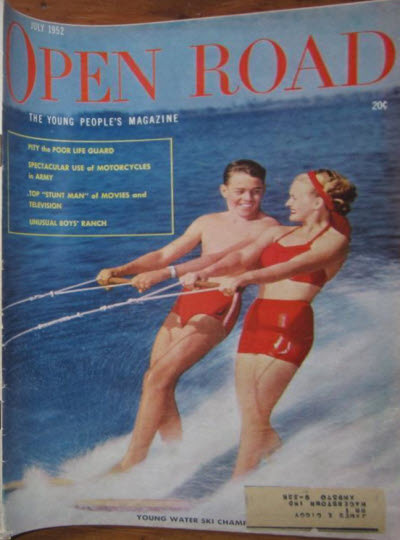 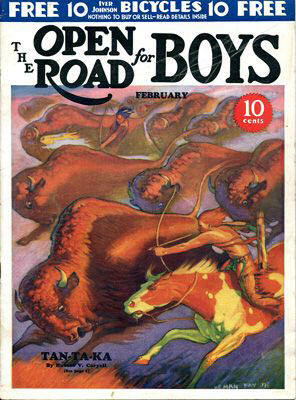 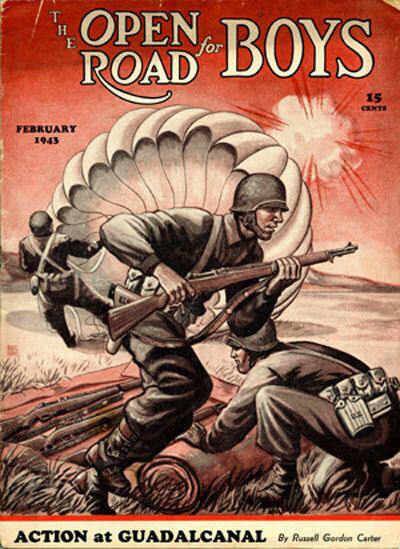 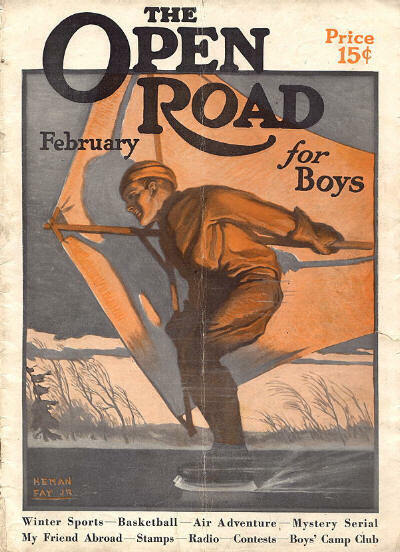 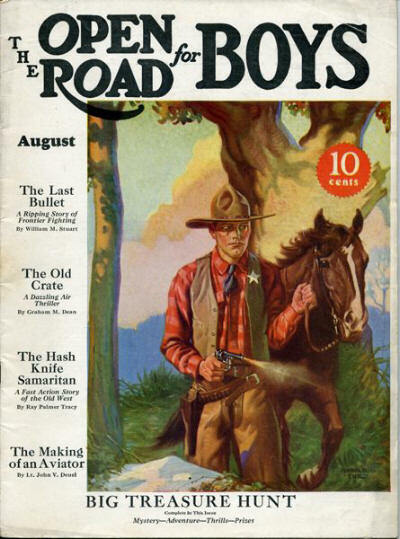 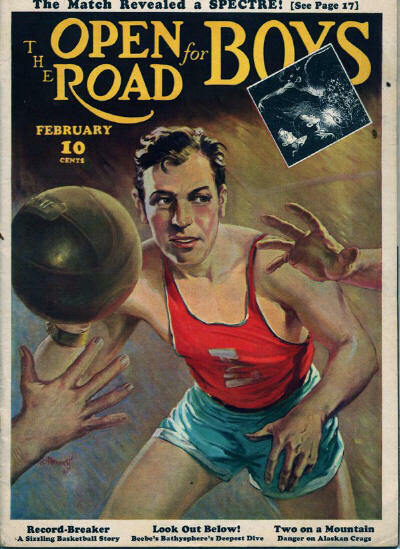 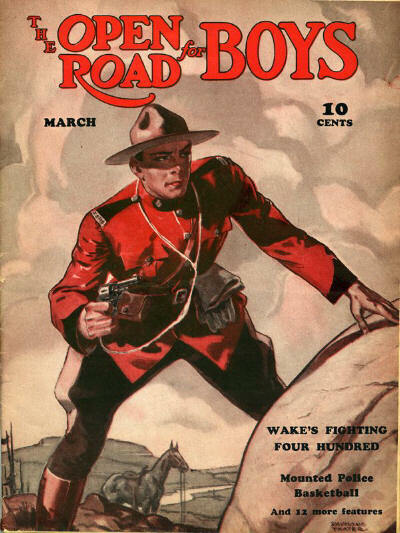 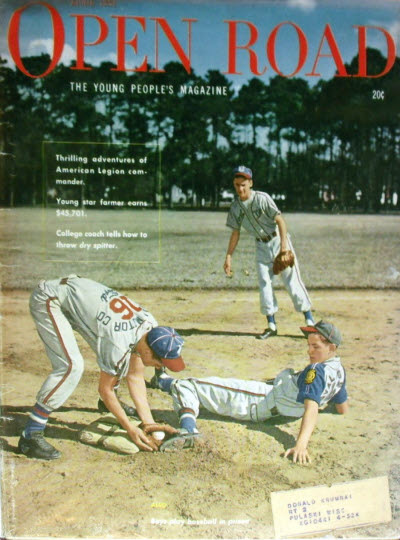 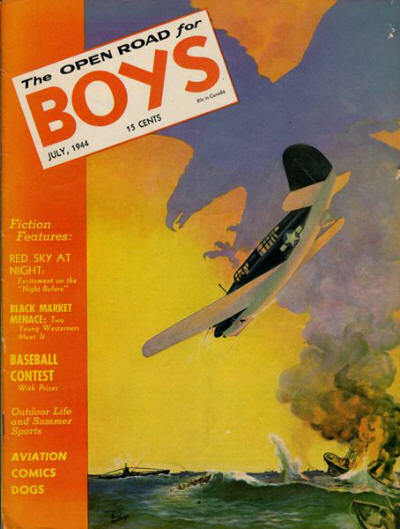 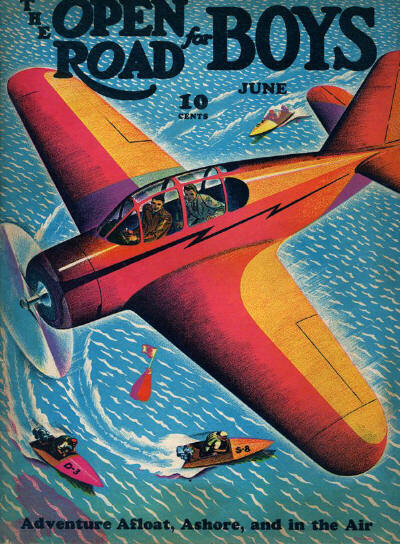 The Open Road for Boys was a boys' magazine encouraging the outdoor life. 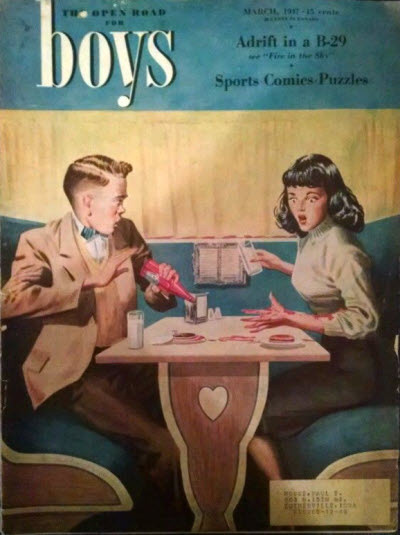 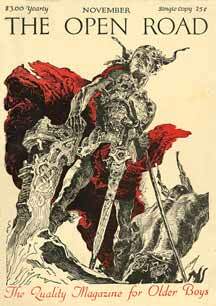 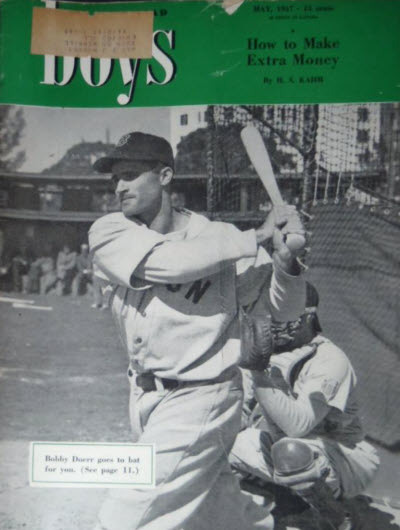 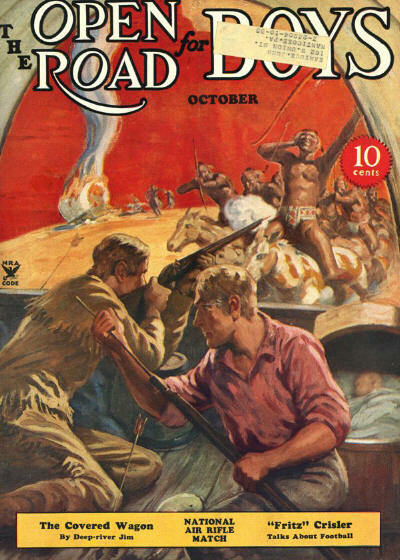 It was published from November 1919 to 1954, and featured a large amount of fiction. 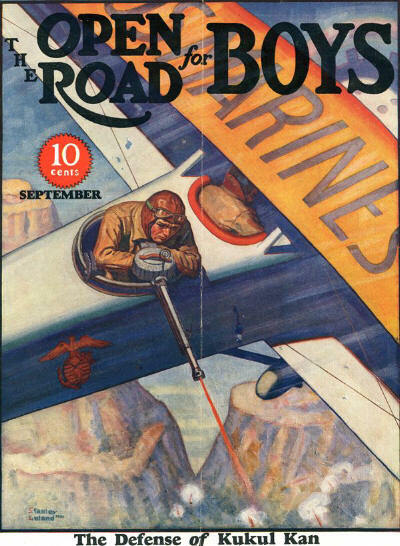 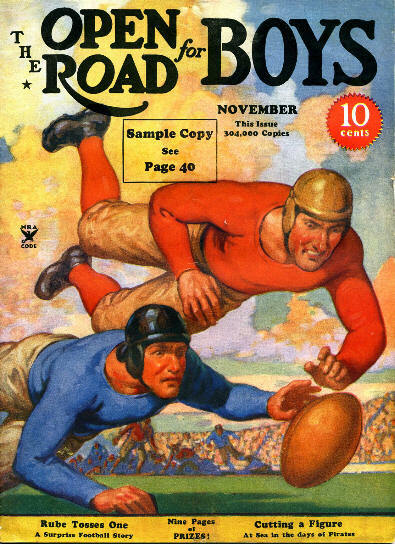 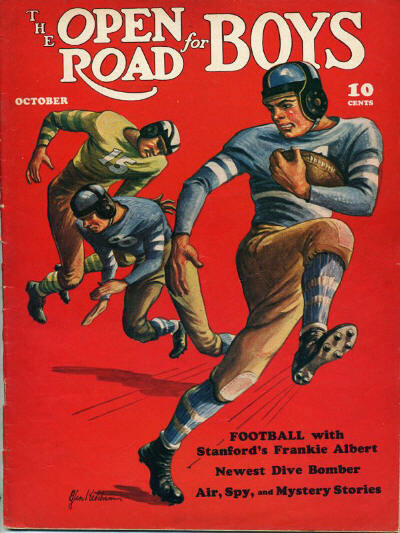 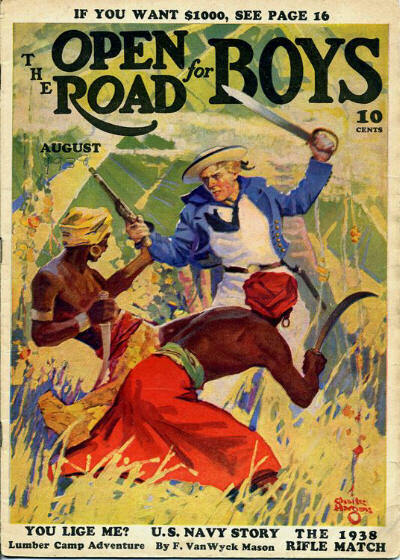 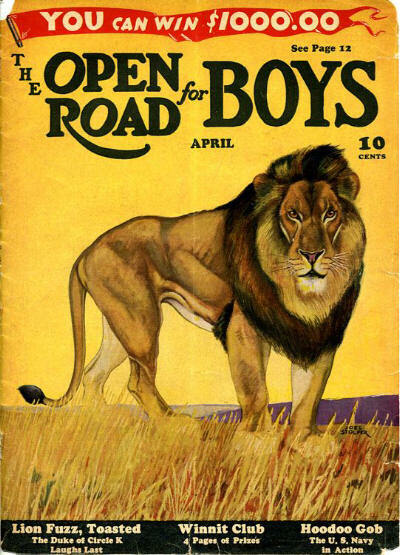 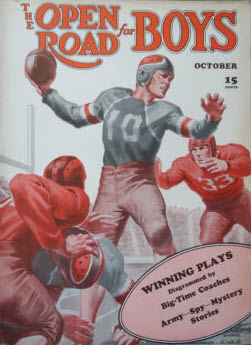 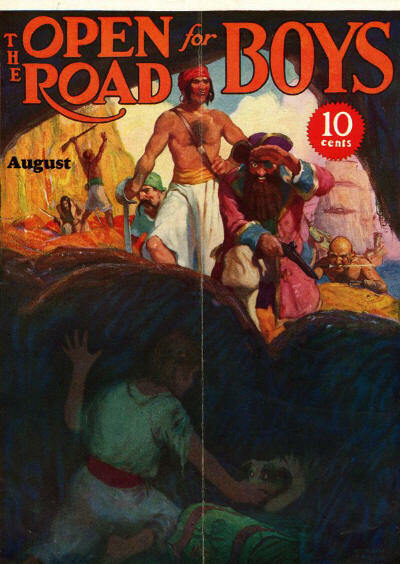 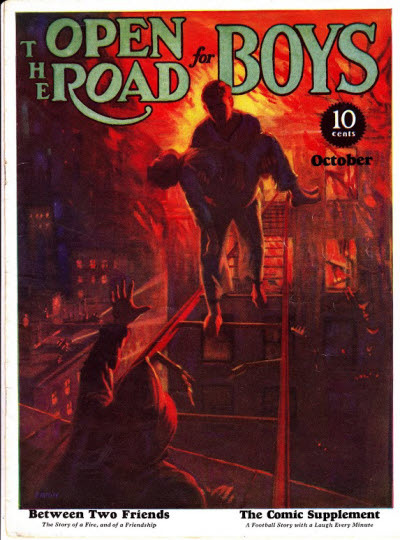 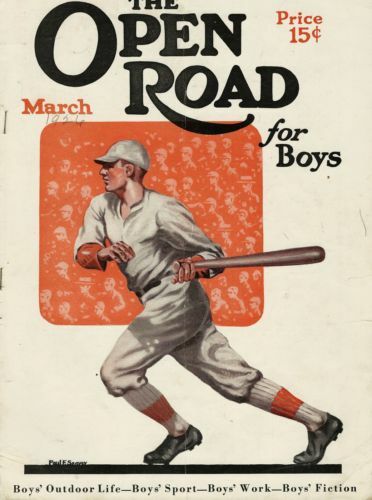 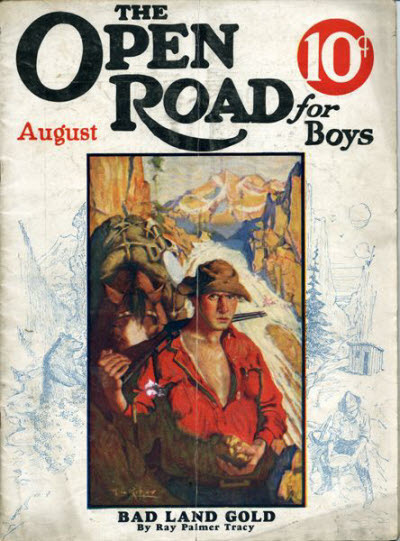 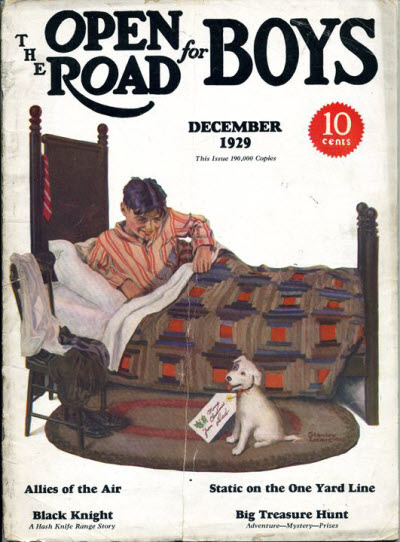 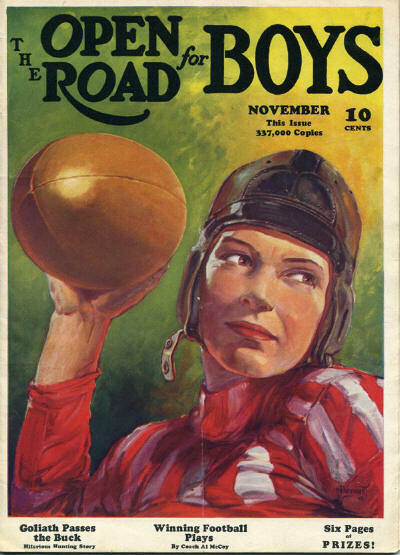 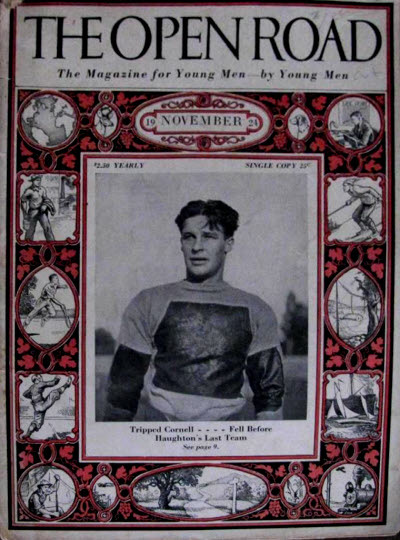 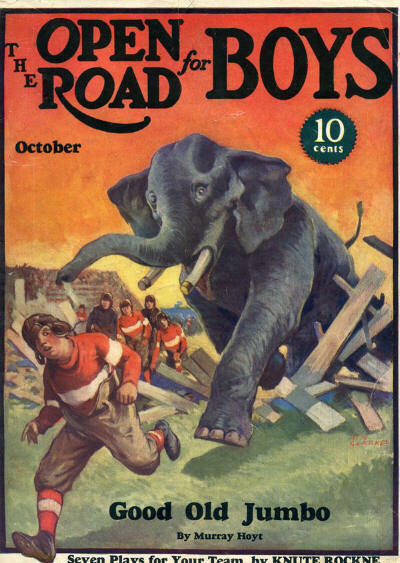 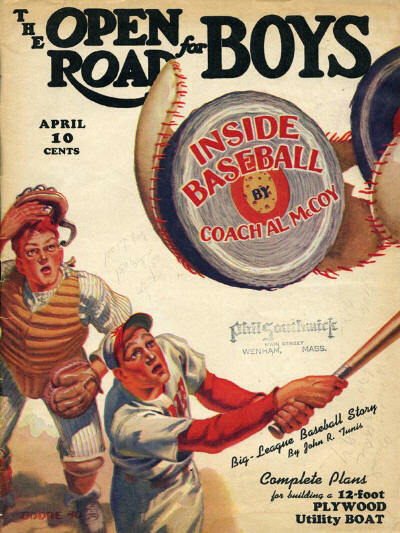 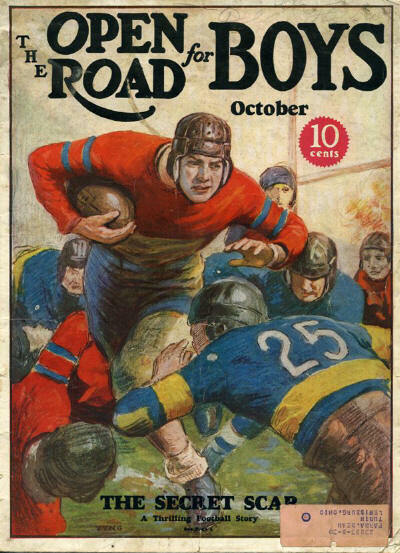 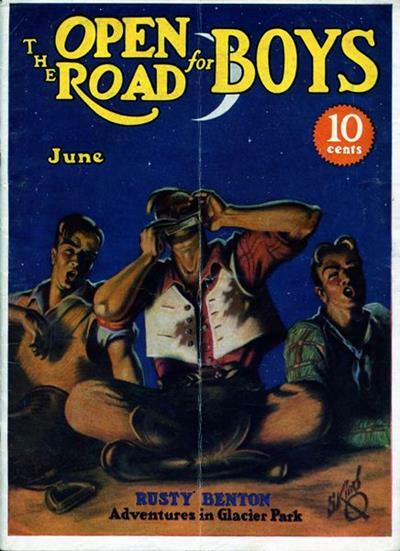 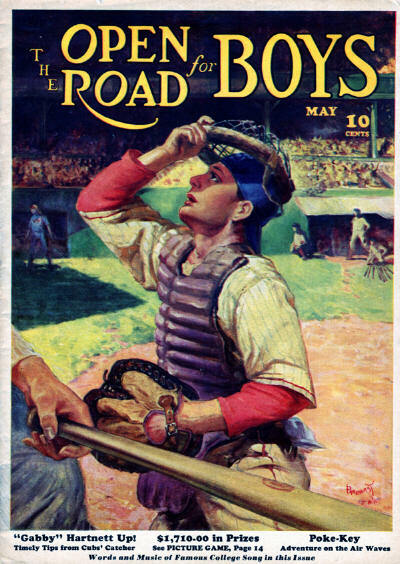 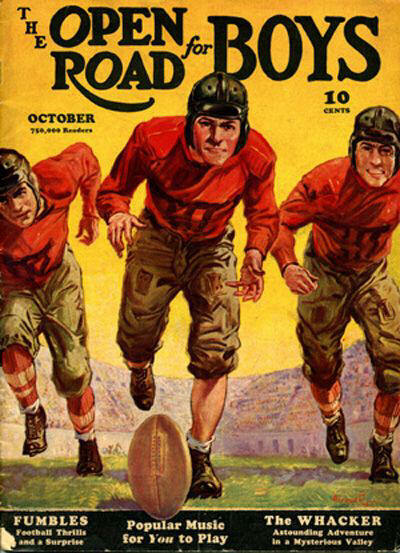 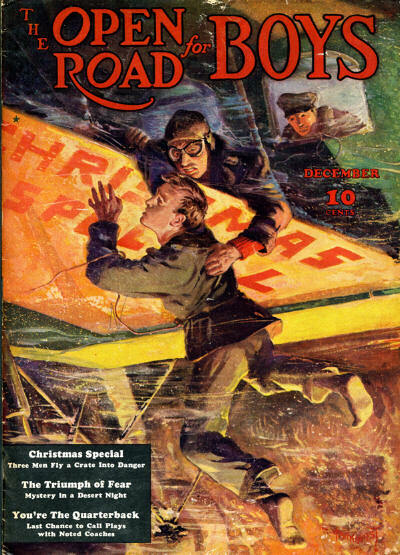 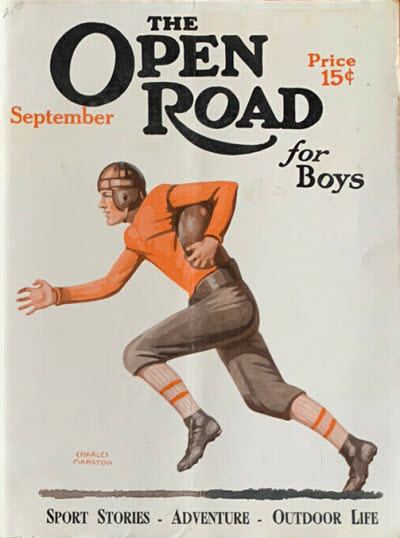 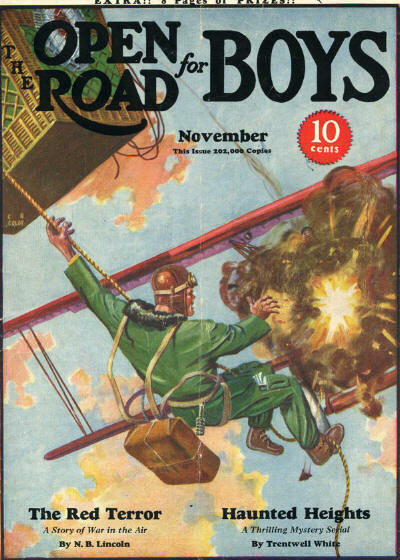 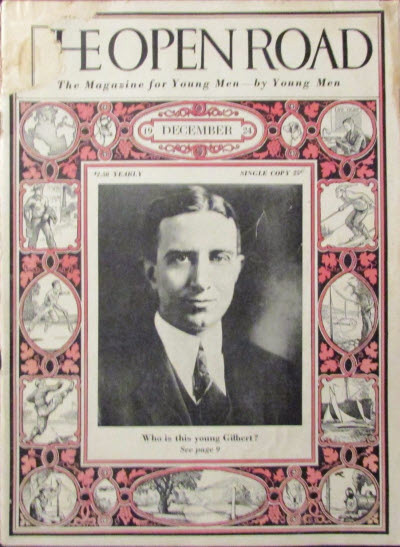 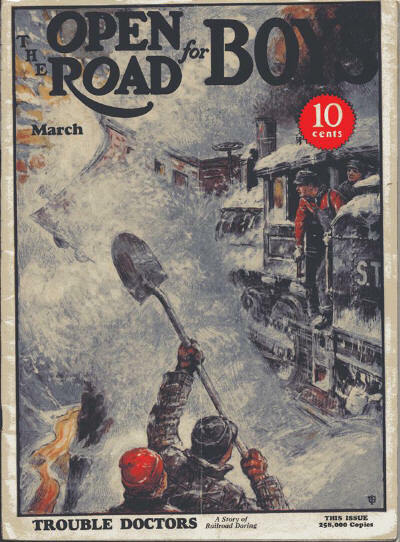 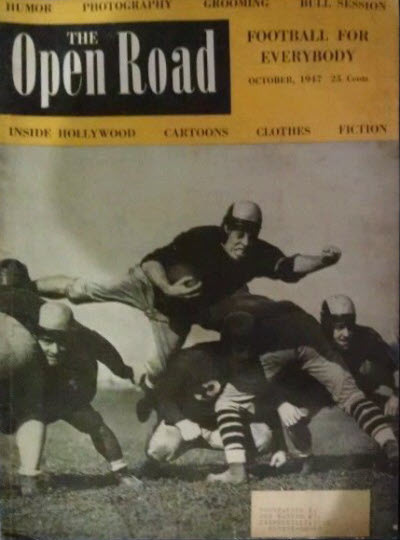 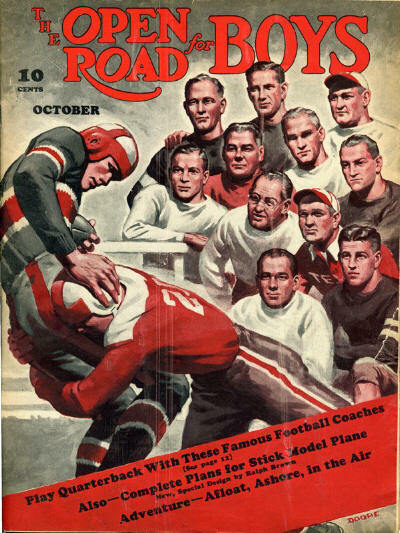 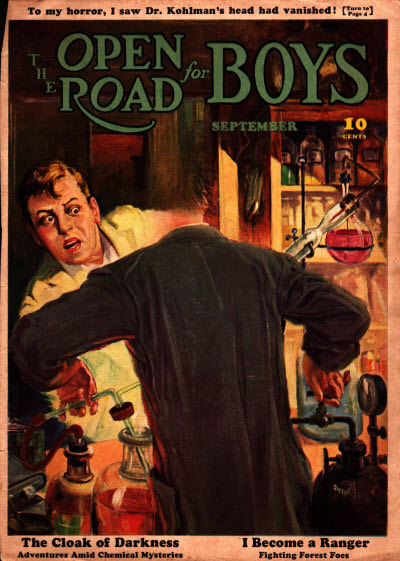 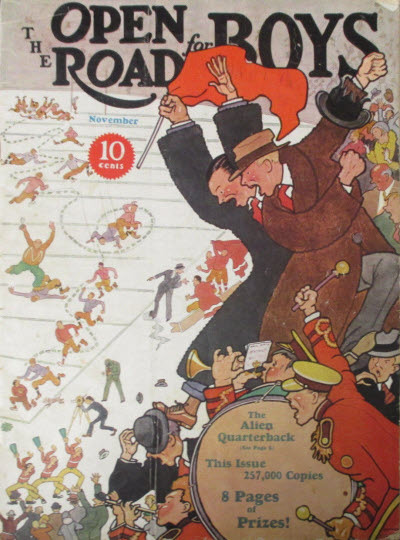 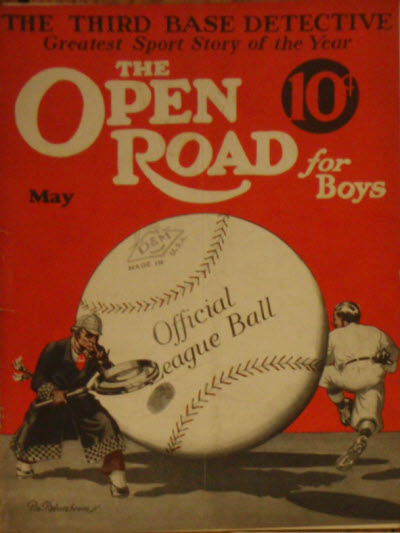 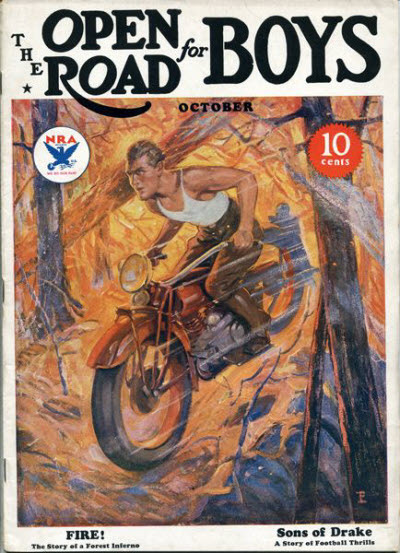 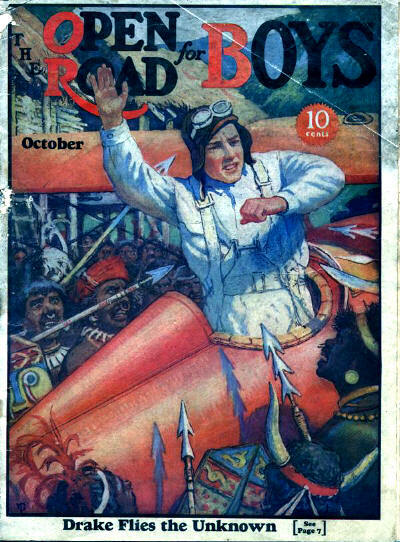 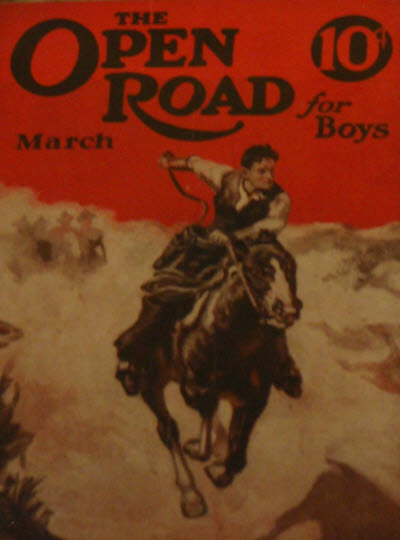 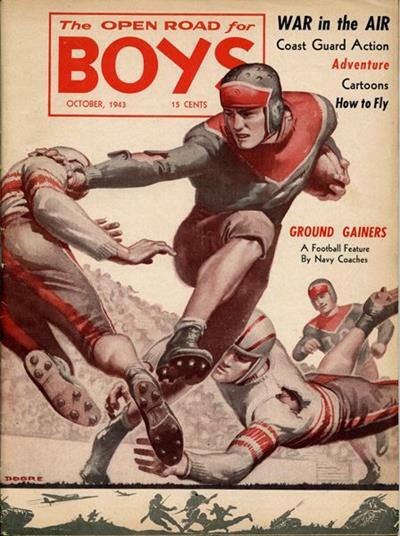 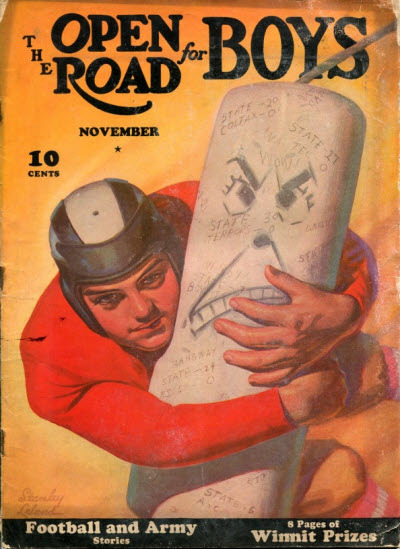 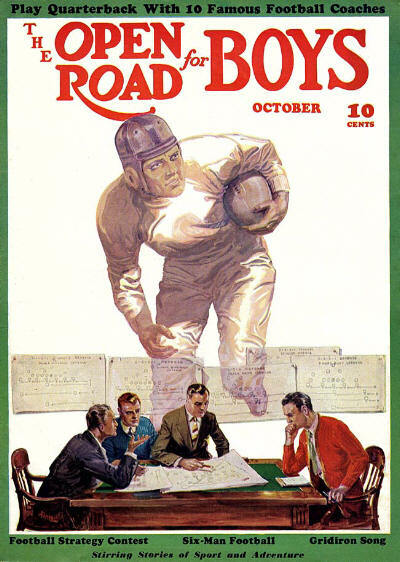 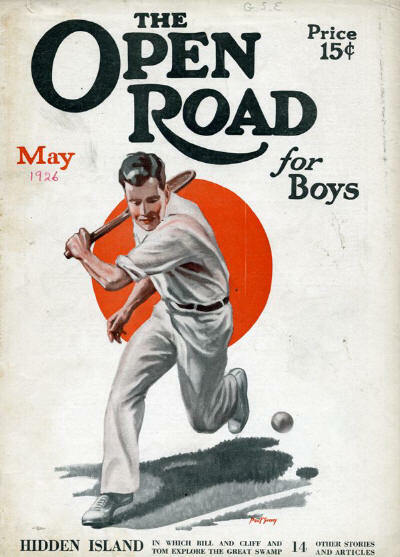 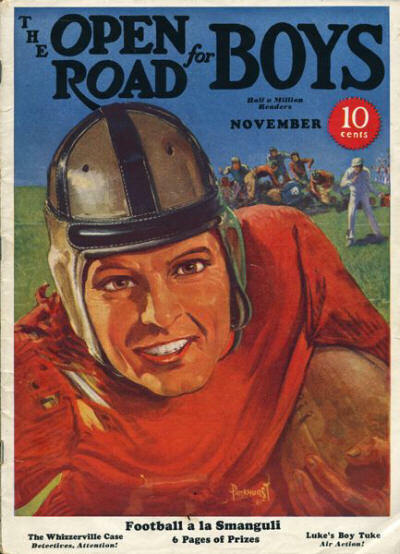 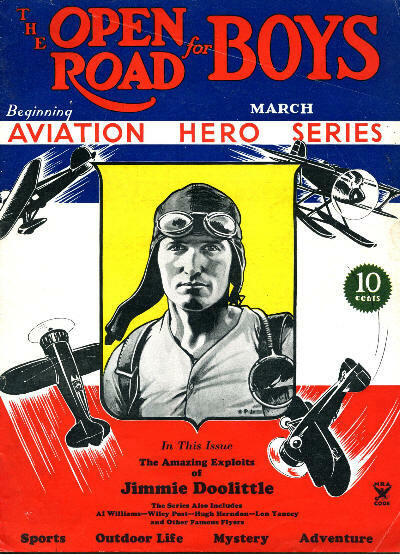 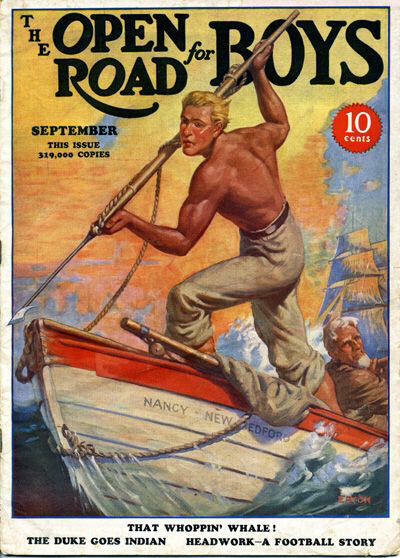 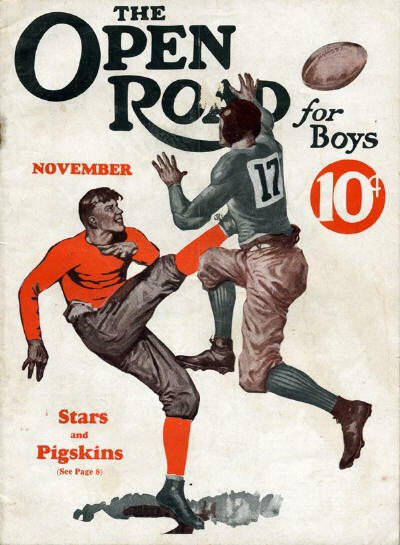 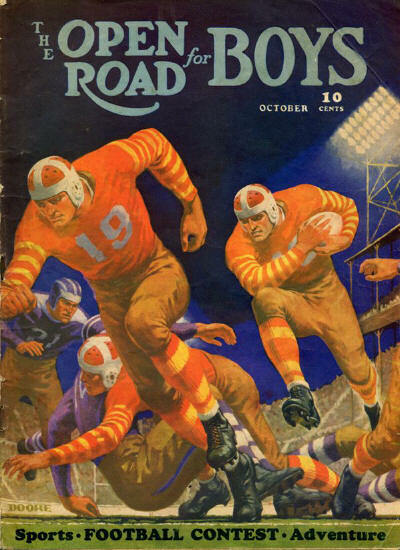 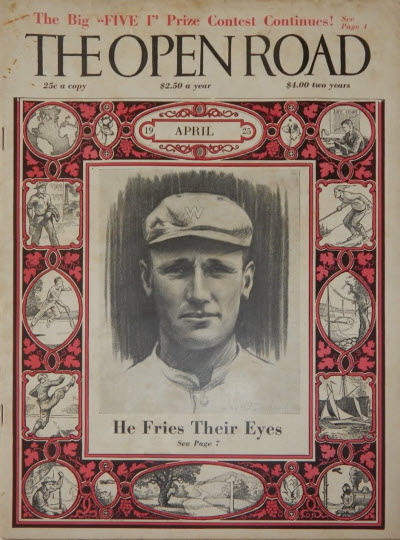 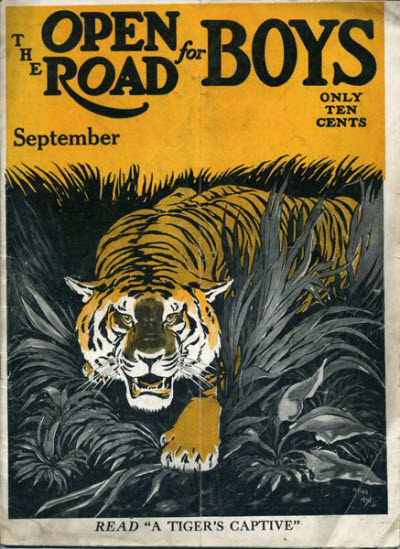 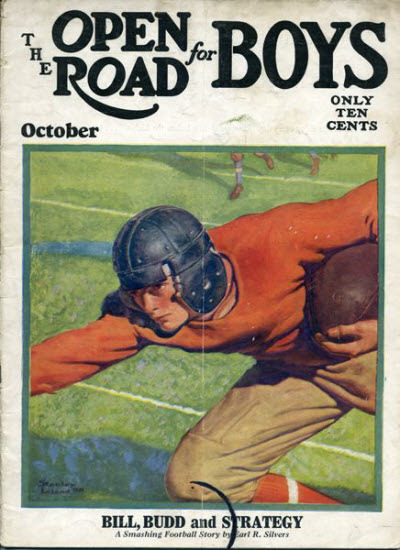 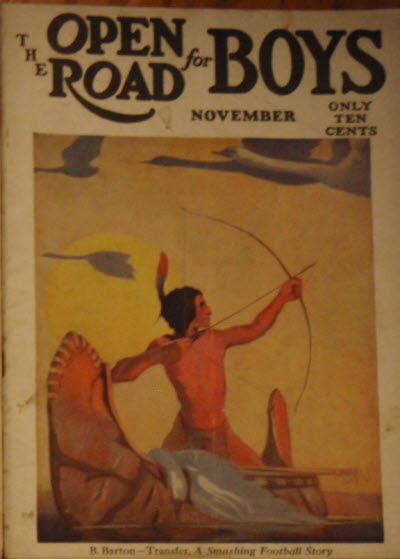 Initially the title was just The Open Road, but this changed to the more familiar The Open Road for Boys in October 1925. 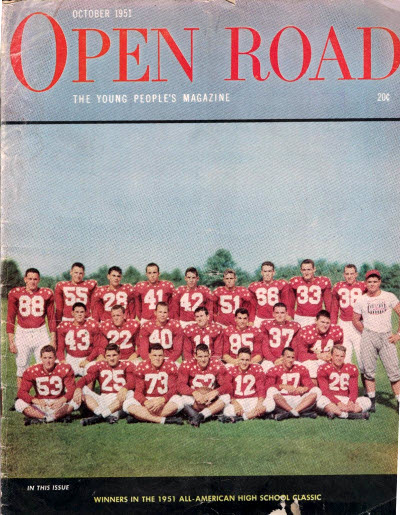 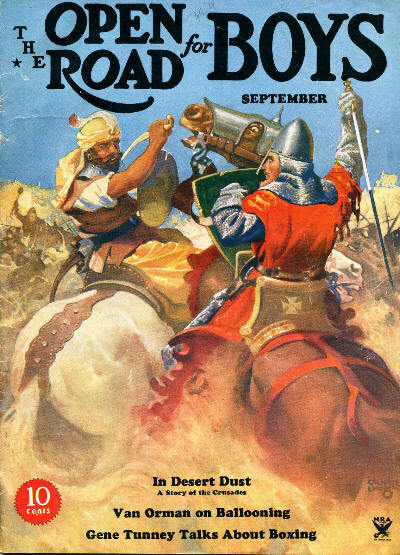 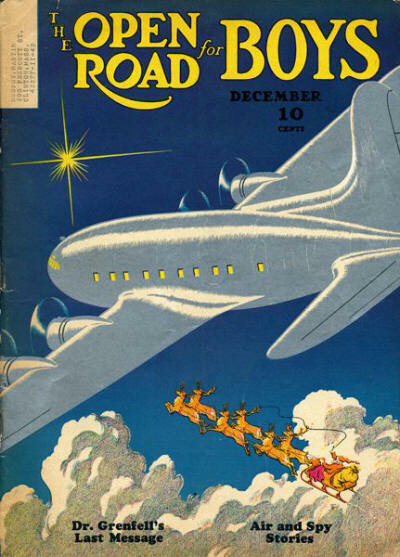 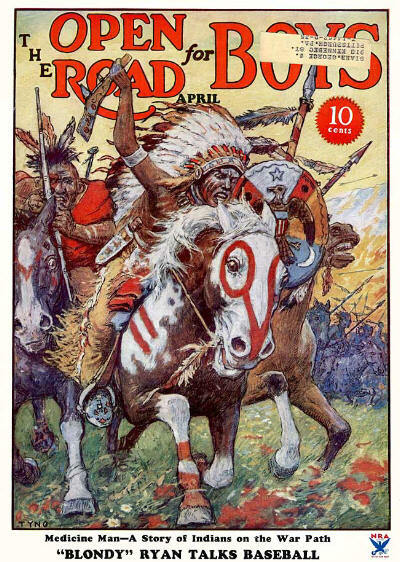 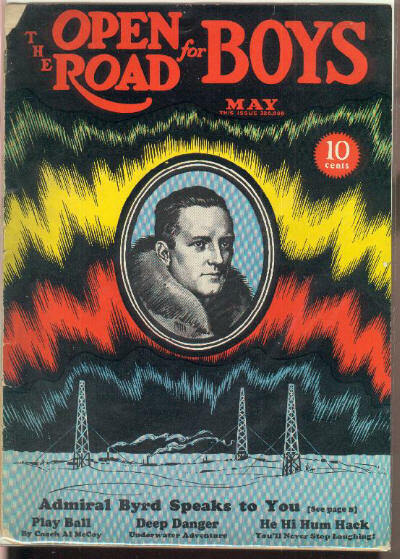 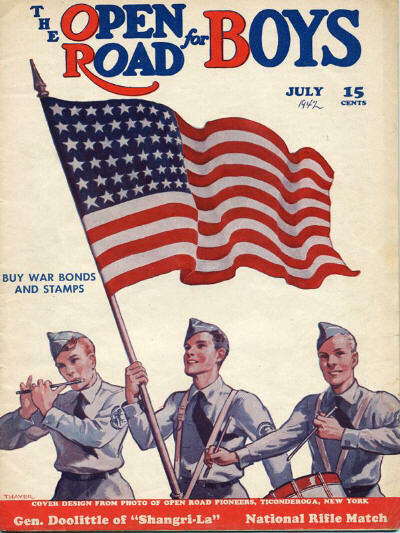 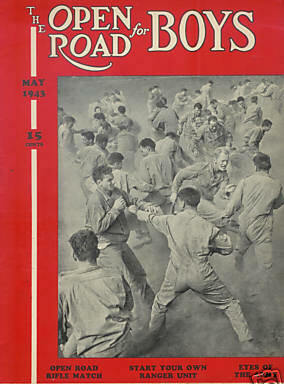 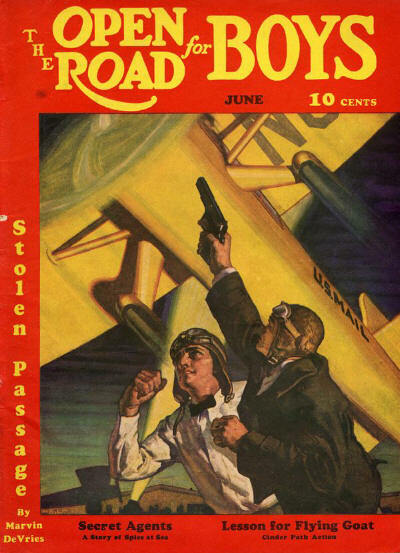 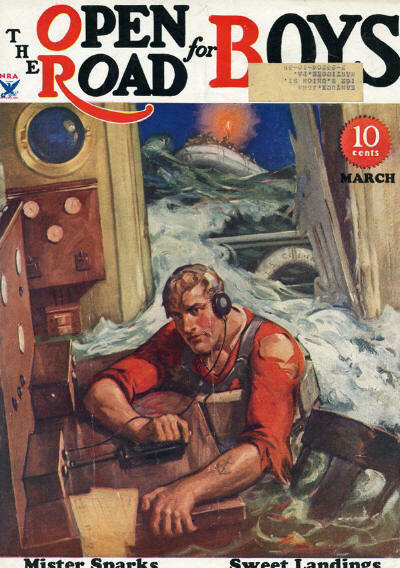 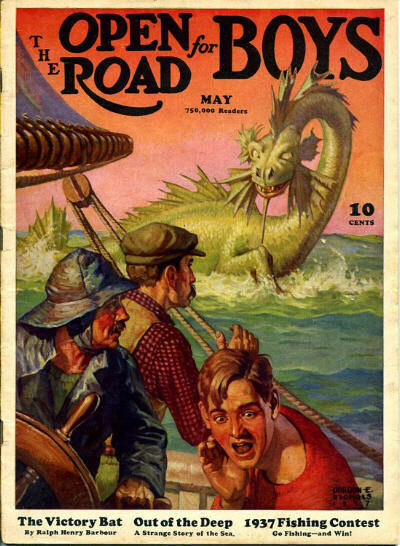 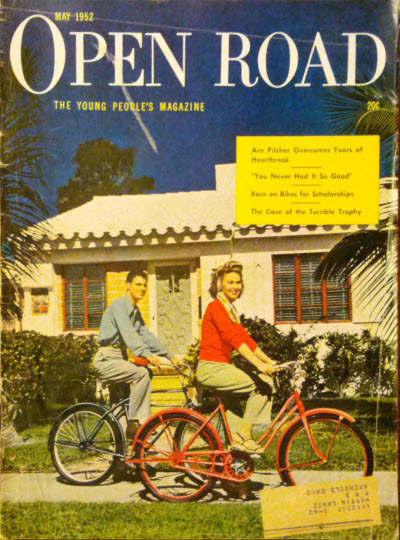 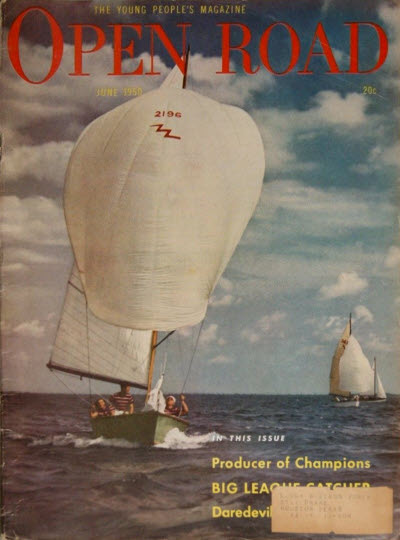 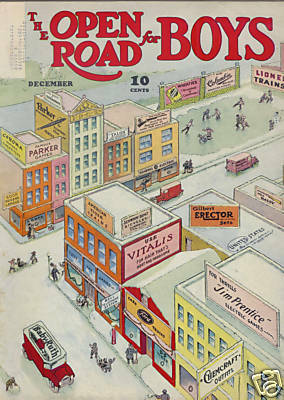 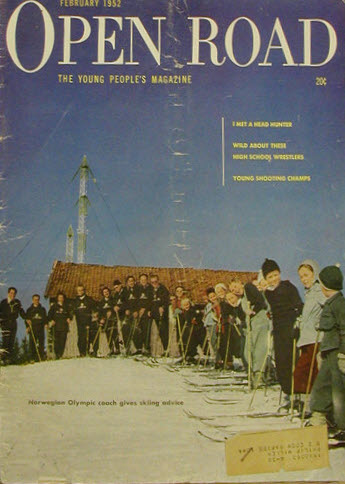 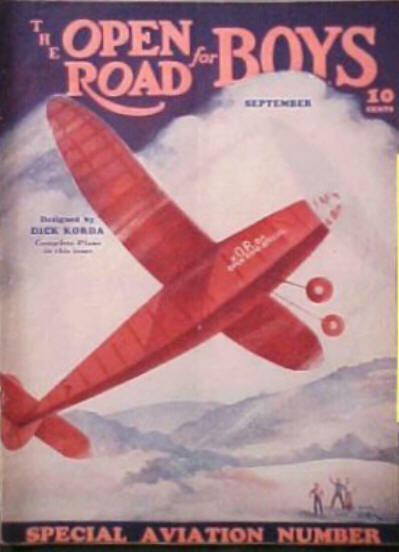 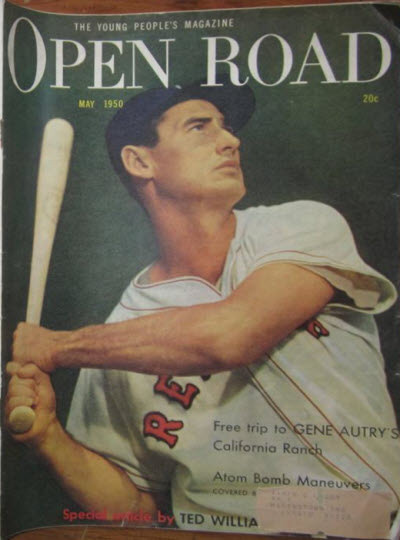 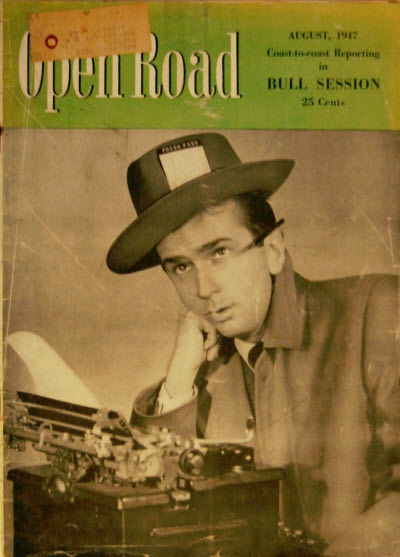 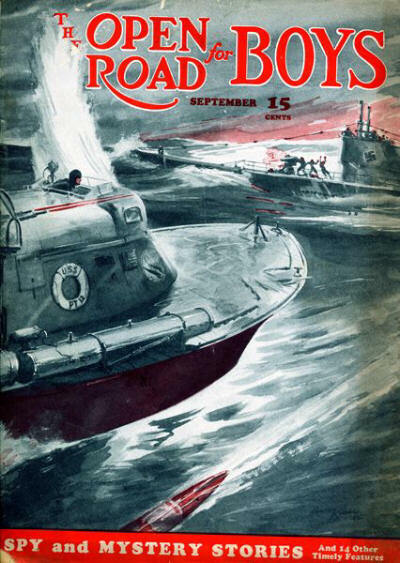 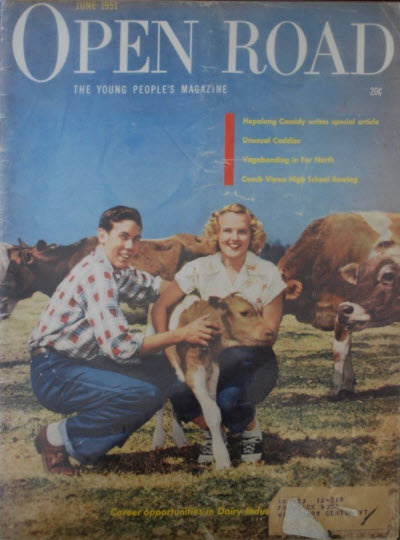 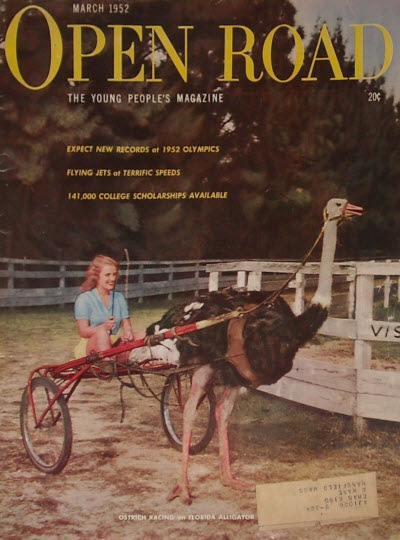 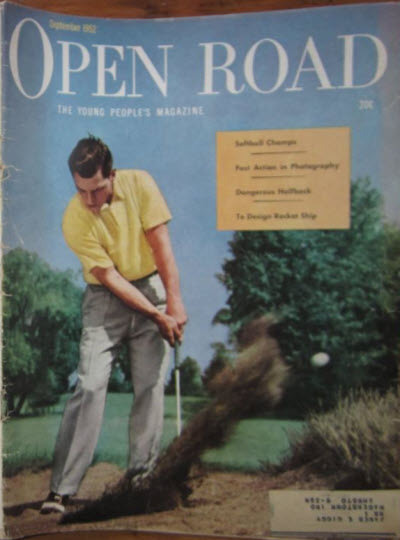 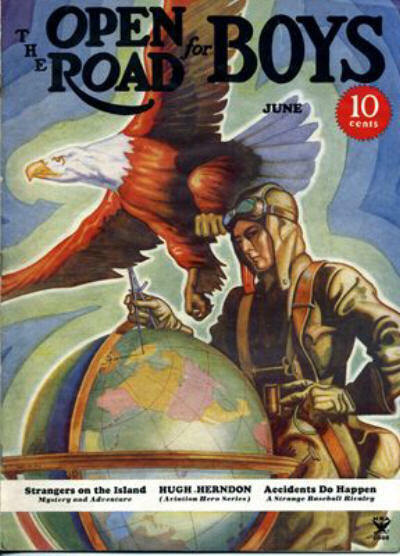 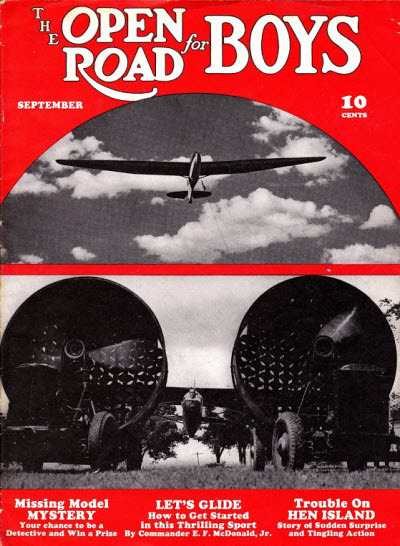 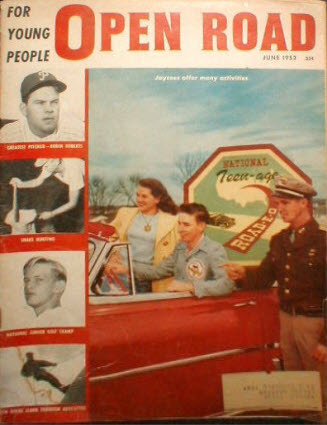 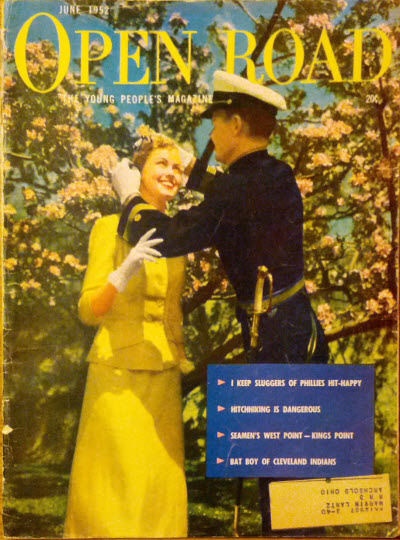 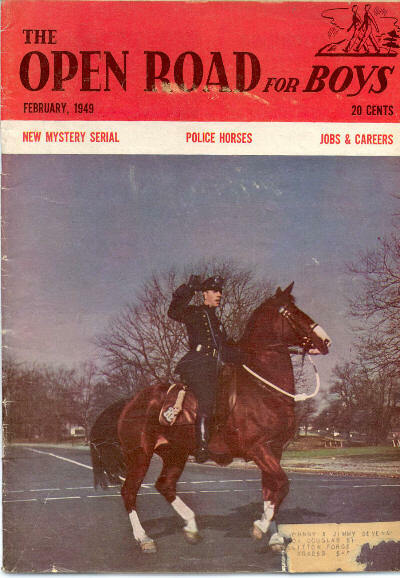 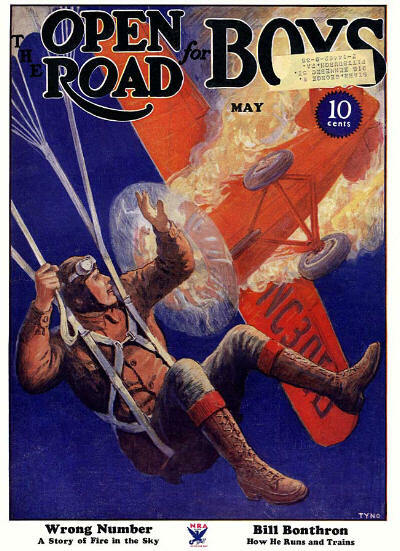 After a further 25 years the title was changed again, in April 1950, to Open Road: The Young People's Magazine. 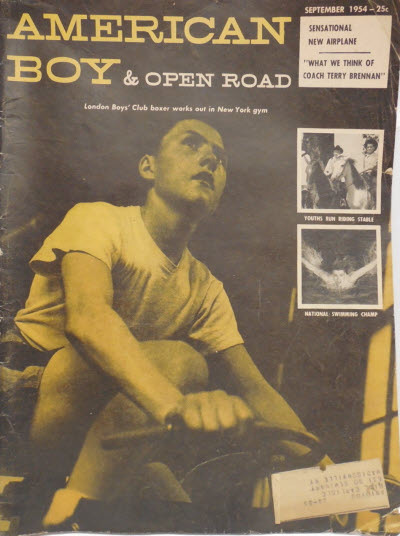 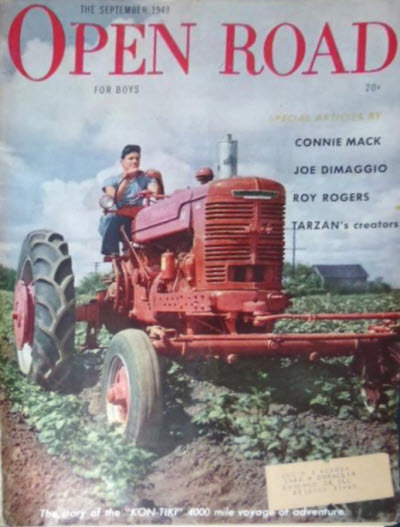 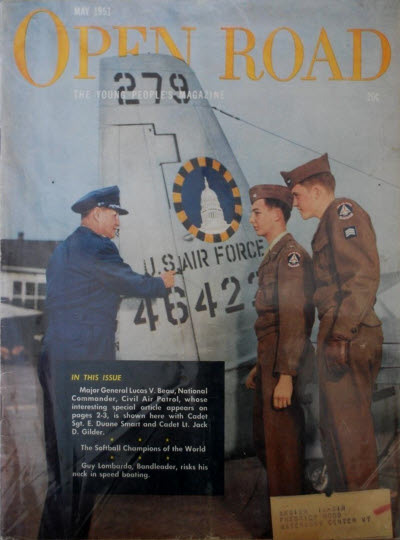 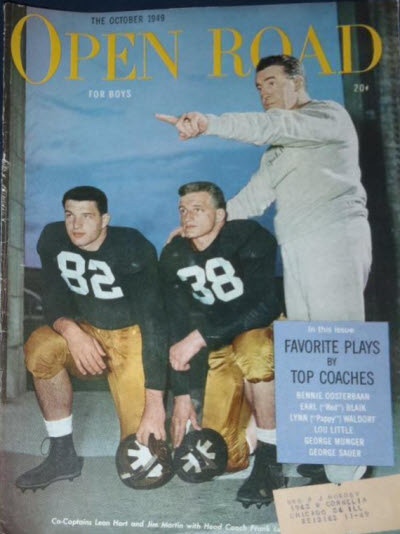 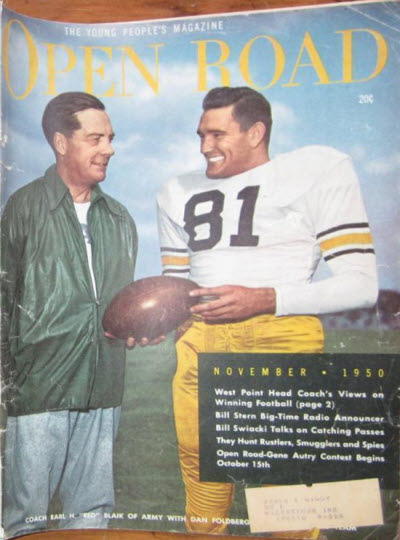 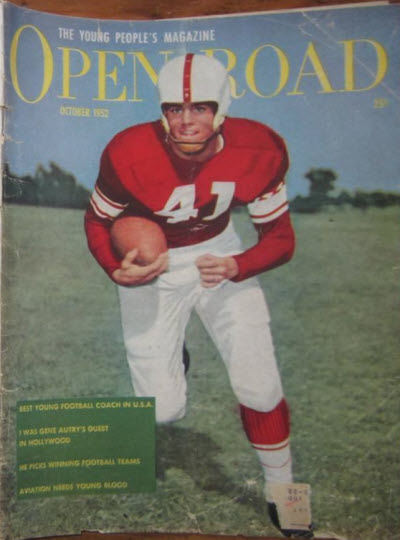 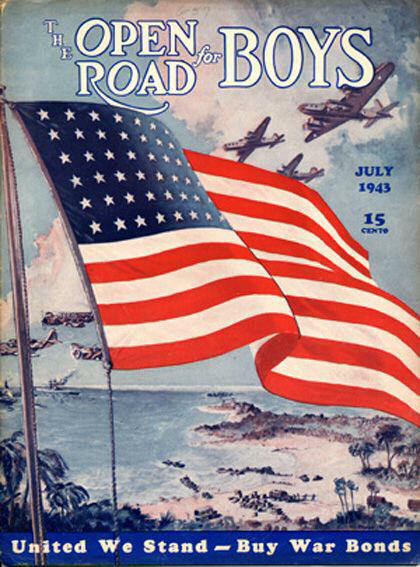 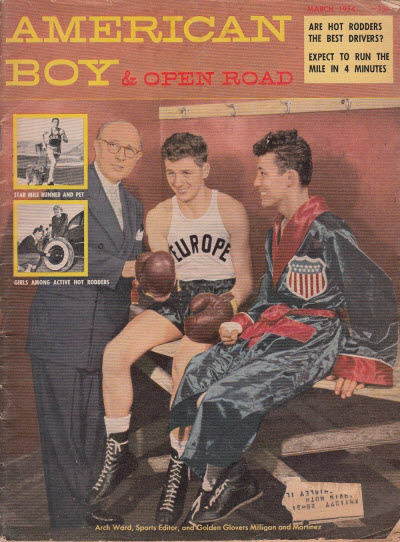 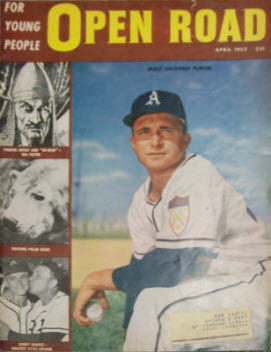 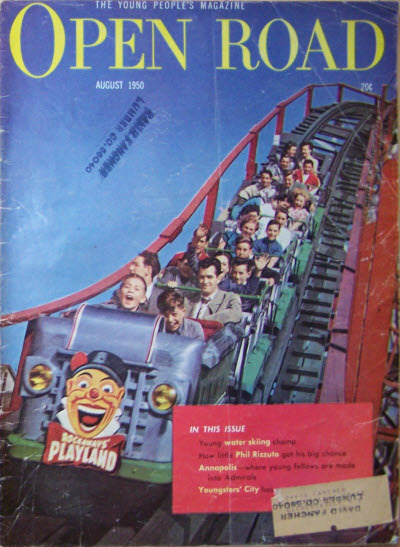 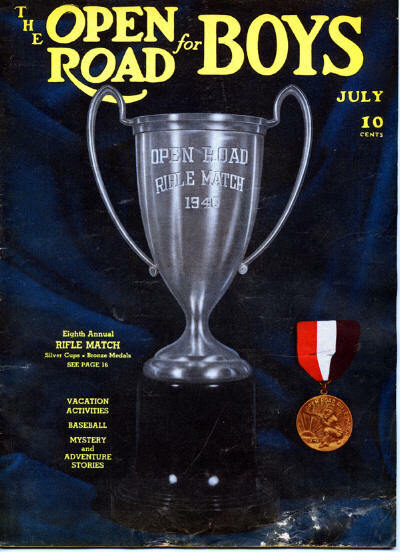 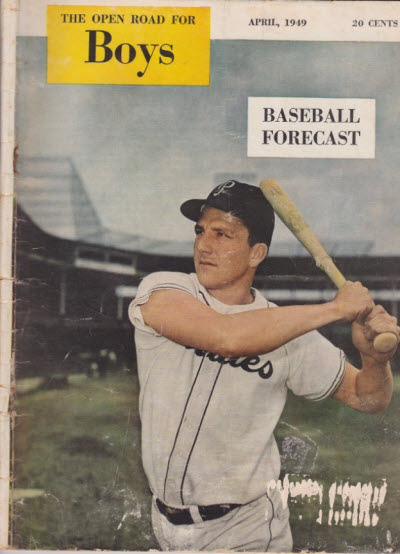 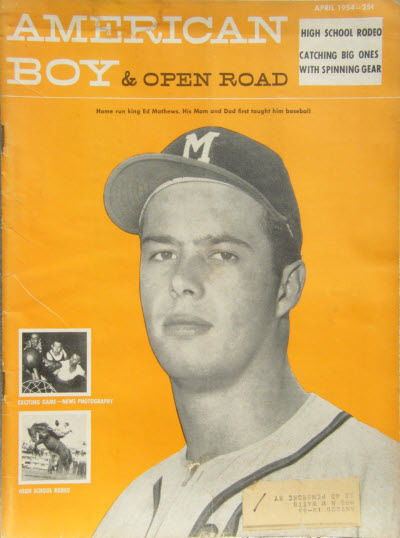 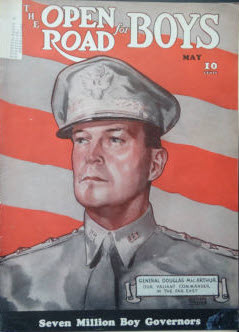 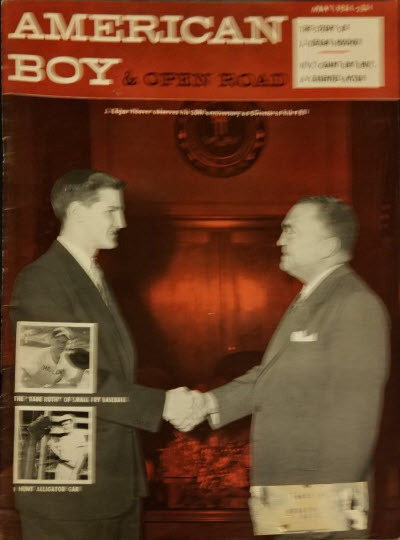 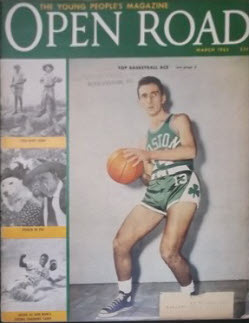 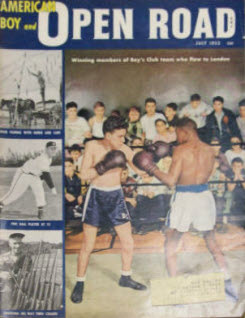 The title changed again, in July 1953, to American Boy and Open Road but this did not last long as the magazine folded some time in 1954. 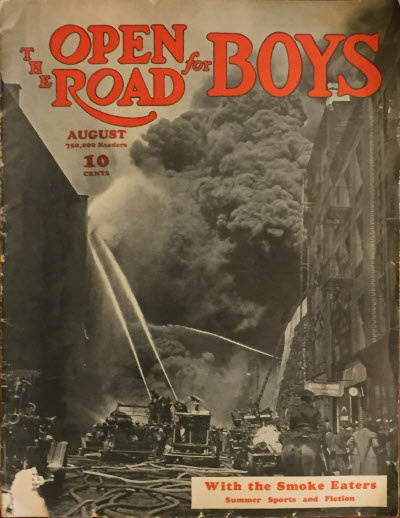 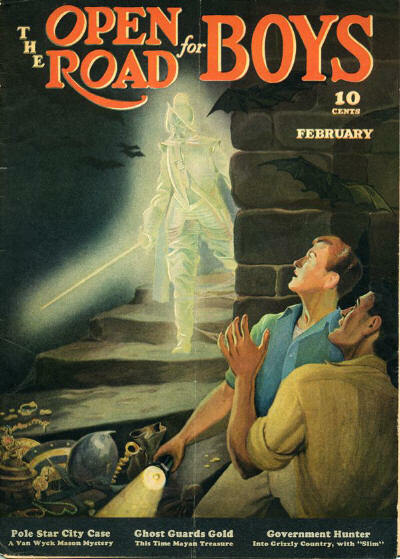 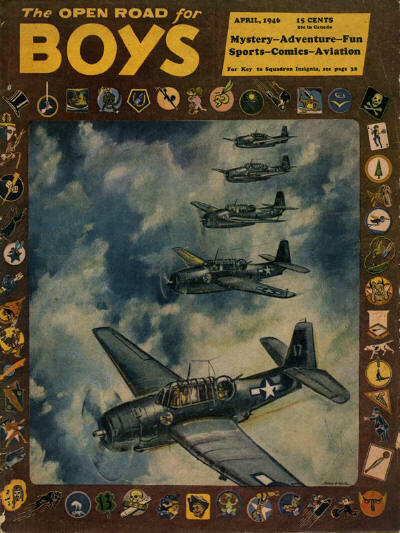 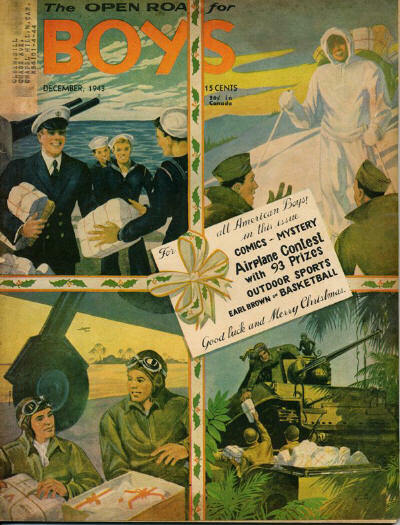 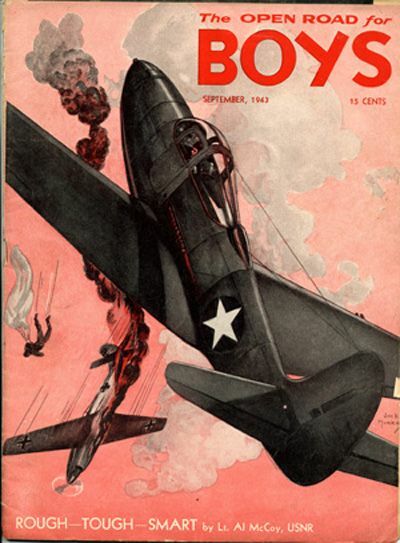 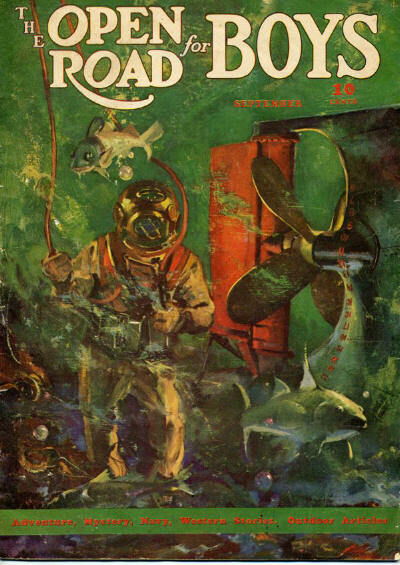 For the first twenty years it seems to have published on a regular monthly schedule, before dropping to ten times a year in 1941 (although the precise schedule during World War II is unclear).